I am delighted to announce we are offering a new publication (book 1 of a promised 4 book offering) called COIN-OP CARNIVAL co-authored by Ryan Claytor and Nick Baldridge. The presentation is really engaging and informative. 3 more books are promised at a later date....due to the immense amount of art-work needed to be created by hand, it is expected that this may take several years for each....but well worth the wait. I know all this stuff, but still read it from cover-to-cover and enjoyed it! The announcement of this is currently on Pinball News where you can see some sample pages to get a better feel of the product. Book is 5-1/2” x 7-1/2”. 64 pages, quality paper and presentation. PBR part number is BK-COC-1 and price is $15. per copy. To respond to customers asking, I have researched and sourced the conductive braided wire used by a number of manufacturers on the bottom of the playfield. With many doing playfield swaps, having new braided wire is far easier than salvaging the old. Part number is MAT-PF-BRAID and it is 0.20 per foot. 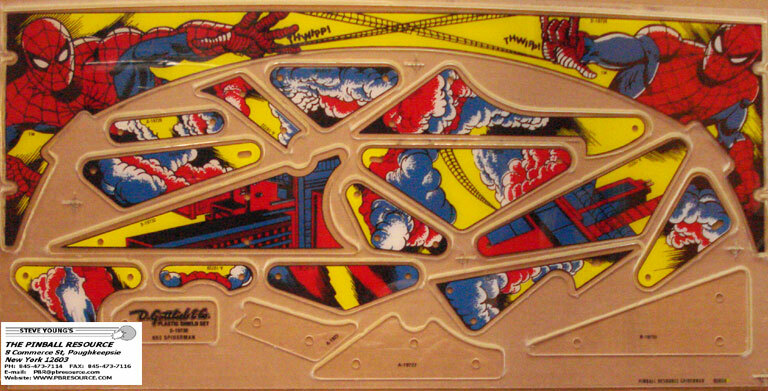 Gottlieb® Spiderman playfield plastics have been reproduced and arrived today. They look great! The set is part number GTB-D19736+ and is $99.47 per set. Keychains. Keychains? While we usually try to keep to pinball parts, once in a while we deviate. Saw one of these with a pinball friend and thought it was cute and gave me an outlet for some “off spec” parts. 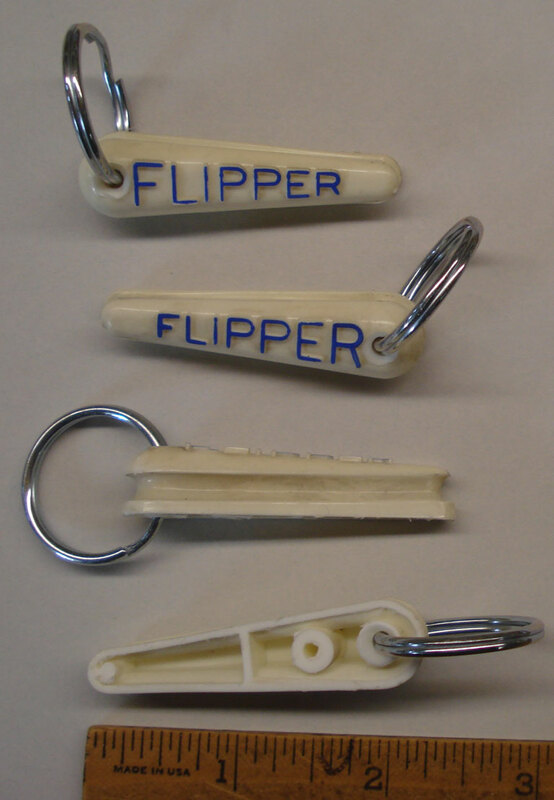 So, I made some pinball flipper keychains. 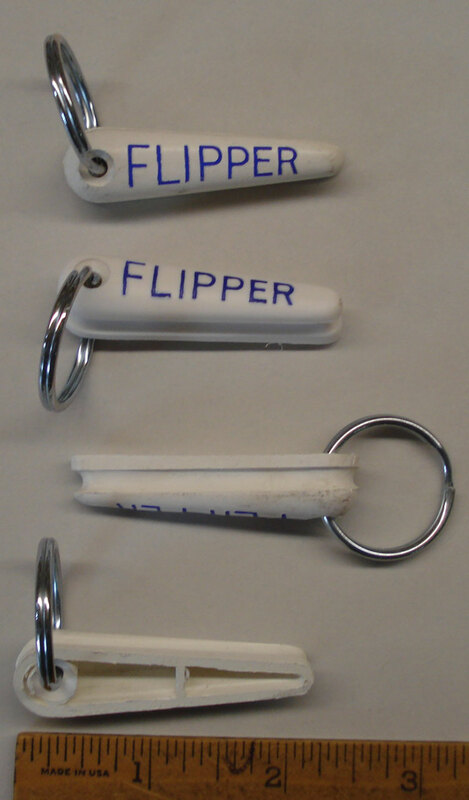 These are made from various styles of 2” flippers by sawing off the flipper plastic slightly below the rubber ring groove and adding a 1” key ring to the mounting hole for the flipper. It takes a little time to clean up the cut and they vary a bit. These are “off spec” because of slight plastic color variations preventing us from making pairings. The print is ok. As I am making from off spec parts, supply may be limited as it would be silly for me to cut up perfectly good flippers to make cute keychains. There is no choice of right or left. Printing is usually blue. 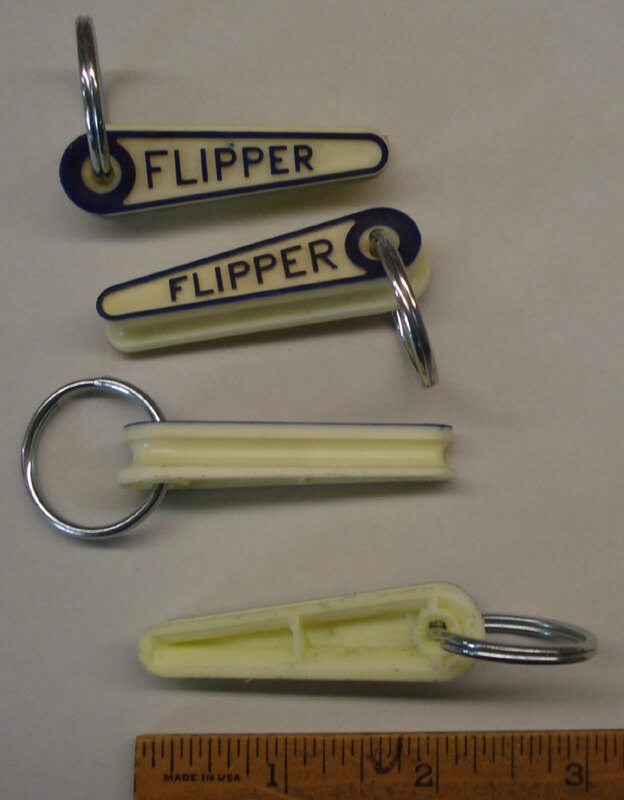 I am looking for a bag of flat top printed flippers that were off color, so I expect to add that as a 3rd variation KEYCHAIN3 $5.00 each. In an attempt to get wider distribution for PINBALL MAGAZINE, I have agreed to offer the magazine thru PBR. As you may be aware, this is not treated as a magazine with a subscription, but each copy is sold independently. The first issue we are distributing is issue #5. This issue contains a number of interesting articles heavily centered on Wayne Neyens, Gottlieb designer who just celebrated his 100th birthday. -Gordon Hasse review of Wayne Neyens career. -Wayne Neyen interview, review of all his designs, etc. —these first 2 articles comprise 232 pages! Whew! Just typing all the titles wore me out! Most photos are color (some of early game photos were only B/W and some archival photos are B/W) but the book is real eye candy! In any event, the magazine (more like a book, weighing 3 pounds is available here. Cost is $40 a copy. Issue is Priority mailable in a padded flat rate envelope...shipping PM in the US is 9.10 with postage and handling. European paper size 8-1/4” x 11-3/4” but still fits in padded bag. Price on magazine is net. If I receive sufficient interest, I will offer available back issues as well. These have not been priced as of yet. I was offered a rare lamp by one of my customers. #545 are blinking wedge lamps made only by GE for Williams. Used in 3 games: Dirty Harry, No Good Gofers, and Twilight Zone. Original Wms part number was 24-8825. We have listed them on our lamp page as LAM0545...10.00 per box which is actually less than they used to cost “back in the day”. It was especially nice to find these as they were a GE only part and no one makes these any more. I looked many places to find remainders, etc and was always unsuccessful. Remember, it is the little details in the recipe that make the sauce so good....so here are a couple of little details that have been bugging me because they bug my customers....and when I do my own restoration, I get doubly bugged. Escutcheon pins....the small nails used to hold flat ball guide rails to the wooden arch sticks on pinball playfields. Where to find? I have been looking for a long time. Well I stumbled on them looking for something else. Both listed are oval headed 304 stainless, so they look good and can be polished if desired. 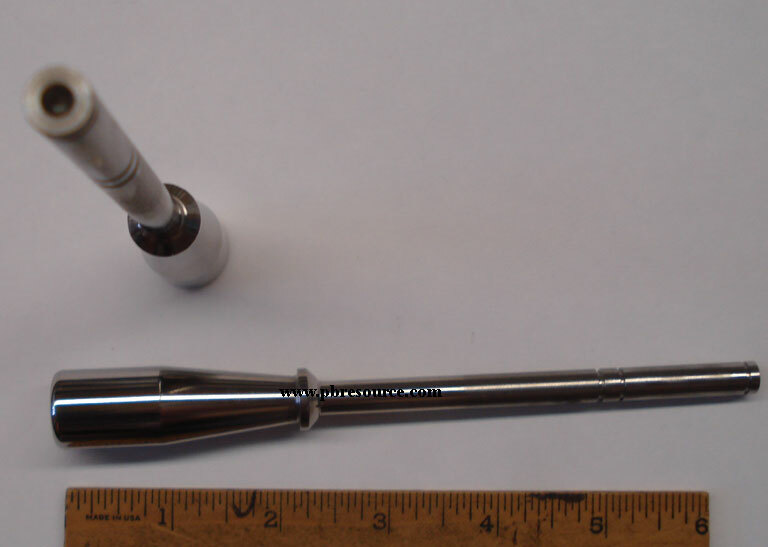 HDW-PIN1 is a 3/8” long, 18 gage (0.048”) pin. This fits what I tested perfectly but I can see there might be a variation that needs to be a little fatter (see below). Cost is $1.00 for a pack of 10 pins. HDW-PIN2 is a 3/8” long, 16 gage (0.063”) pin in case the hole is a bit larger. Cost is $1.90 for a pack of 10 pins. Suggest you have both on hand. Ball guide wire....we often get requests for wire ball guides which are missing and there is no inventory and none to be found. Time to make. So, we send out longer ball guides and the customer then re-bends and trims length. I think it would be more better to just pick a 1 foot piece and make it easier. So...found some material that will work. It is 3/32” diameter 18-8 stainless steel with a matte finish. Looks pretty good as received but could be polished if desired. I have to buy in a roll and cut, so it will arrive with a slight bend to it. It is pretty tough material! Customer will need to straighten it a bit and then bend to desired form. A good item to carry in your toolbox. MAT-BALLWIRE 3/32”x 12” 1.00 each piece. I cut it at 12-1/2 inches so you will get a full foot at least. Prompted by a customer question this week about an early 70s Williams flipper button that is not available, I decided to do some research on flipper buttons...got out the calipers, old catalogs and prints where available. The results are interesting. The bottom line is that the Gottlieb A-3562 button that we manufacture will substite for a number of other Gottlieb and Williams buttons with just minor adjustments! The basic adjustment needed is the addition of electrical insulation for applications where the plastic button needed is being replaced by a metal button. Some other slight tweeking might be needed with switches. 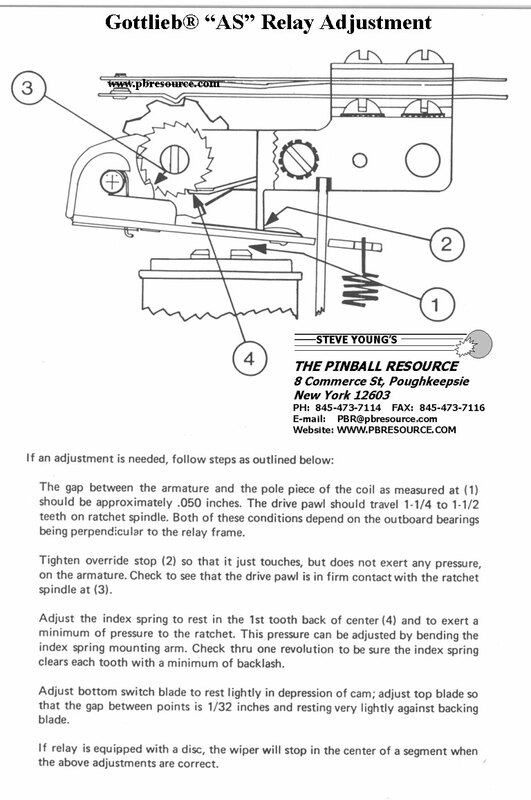 Gottlieb characteristic: Spring tension for button was derived from the flipper switch link assembly thru A3562, then flipper switch blade tension. Williams characteristic: Spring tension for button came from use of a spring. The Wms buttons tend to have an undercut under the button to accommodate the spring. Common characteristics: 5/16” stem, 7/8” length from back of button. This is what allows interchangeability with attention paid to springs and electrical isolation as needed. Electrical isolation can be achieved by adding a piece of fishpaper under the switch if button acts directly on switch. If using with flipper button switch link assemblies, either insure that they have fishpaper or replace with GTB-A9360 and 9361 switches. If spring tension is needed beyond what can be achieved with adjustments and original switches, replace with GTB-B17838 switches. Part number. Notes. Print/catalog date. Gottlieb® Genie playfield plastics have been reproduced and arrived today. They look great! The set is part number GTB-C19183+ and is $82.47 per set. This news item is not to sell something, just to make a record. As I restore my personal collection of 1950’s games, I have cheerfully added blinking bulbs to each. Just merrily skipping down the lane. Oops! In looking at the various bills of material for the games I am doing, I casually notice that all (100% all!) the lamps are 44s. This is somewhat bothersome to me as I have tried to be accurate in my restores. So what was the first useage of blinking lamps in Gottlieb® games? In looking at many bills of material for various games as part of answering customer questions, I have been taking notes with this question in mind. Got close enough to an answer, so I looked. Here is what I think is the story: first game design to use 455s looks to be game 211 (THORO-BRED) but first game released looks to be 214 (HAPPY CLOWN). Chronological game design and release dates were not always in sync. So, there you have it....1965 is the magical year! GTB-A12796-D checker pattern for Snow Derby/Queen, Far Out/Out of Sight and Soccer/Super Soccer. All are priced the same at $4.00 per pair (front/back of one spinner). I am not planning to do the 3 spinners on Swing Along, so this will complete the spinner decal project for PBR. GTB-A14514-D refacing decal for JUNGLE and variations. 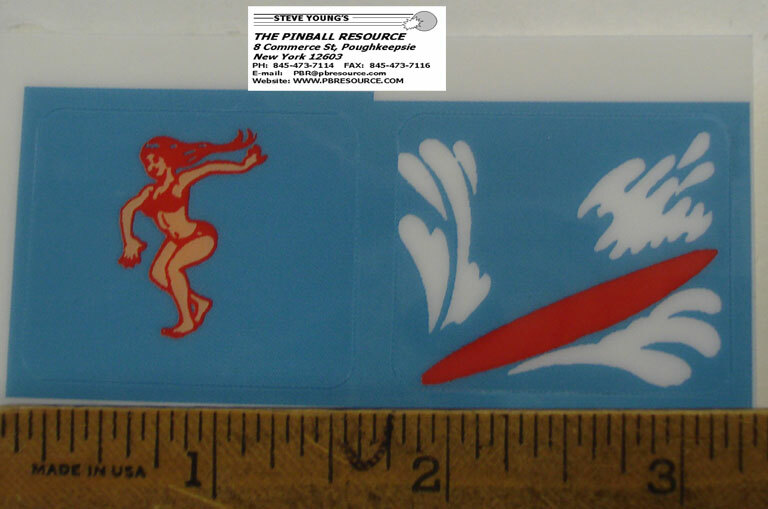 GTB-A16439-D refacing decal for BUCCANEER/SHIP AHOY, etc. These are $4.00 per set (1 set needed per spinner). 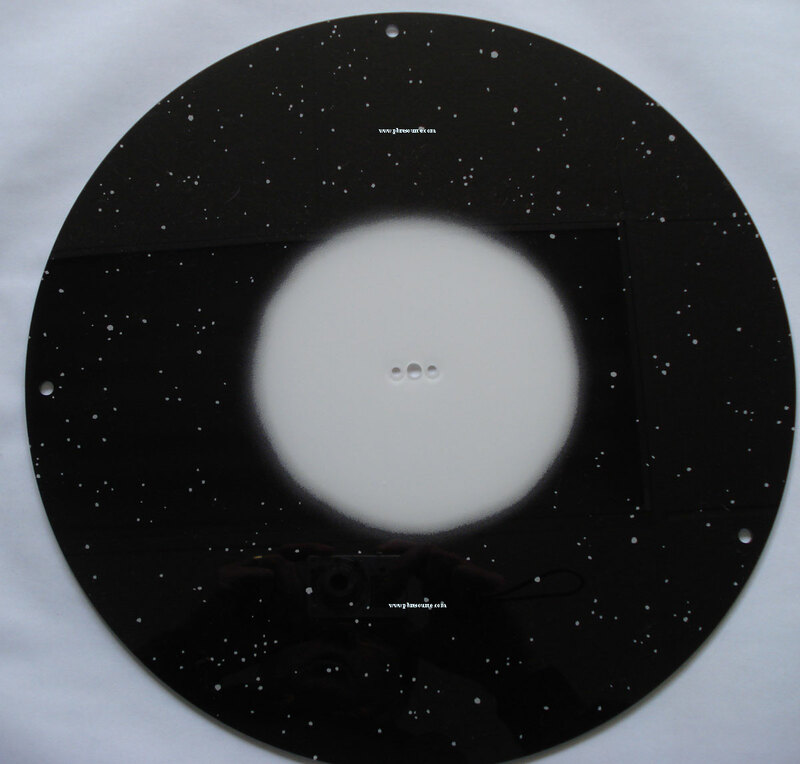 Screened on vinyl with mylar overcoat, so will be durable. These will also fit the replacement spinner BLY-A3460+ in case the spinner itself is missing. Since our supplier became unable to provide the “Pinball Resource Lock” that we have sold for 20+ years with the 1382 key, everyone, myself included, has been sad. I recognize how many customers have depended on us to continue to supply this lock style and key number. The substitute lock just isn’t up to the appearance and quality of the original. The “Pinball Resource Lock” is coming back! I have gone thru different sources and have been able to place an order for this lock to be resupplied to us in both the 7/8” and 1-1/8” versions. I cannot believe (well, maybe I can)how much time has to be expended on such a simple item that used to be a phone call away and one day delivery. Whew! The good news....price will remain the same. Well....the 21st Century has finally caught up with PBR....we are announcing a limited selection of LED lamps. I have delayed supplying LED lamps until now in order that many of the issues with LEDs have been resolved. I have evaluated quite a number of samples. At this point, I am comfortable bringing a simple offering to my customers who have requested them. I emphasize the word “simple”, as the LED environment has very many variations of color, color temperature, dispersion, etc., etc. All lamps sold in packages of 10 and subject to our normal discounting at $100 order. We will be listening carefully to customer feedback. Thanks to the generosity of Sarah St. John in New Hampshire, we were loaned 2 sets of plastic for COUNTDOWN. We sorted thru the pieces and sent a good set off for reproduction. (Several weeks pass.) Boxes arrive....nice! Enjoy! This will make a number of Countdown games look much better without the yellowed white and chipped plastic common with drop target games. OK....now to finish the large bell story! Today, have received the parts to complete the large (5") bell picture. The bell shell (B-2091) arrived earlier this year and I promised to do the rest. Now available GTB-B9359+ which is the bracket, coil, and plunger to ring this bell. This assy has been designed with flexibility to accommodate Gottlieb, Bally or Williams coils. The part number implies a Gottlieb A-5143 coil, but you may substitute another manufacturer's coils at the same cost. Ordering details: GTB-B9359+ is $30.66 and specify coil if different than A5143. Now....I am done with bells for awhile! 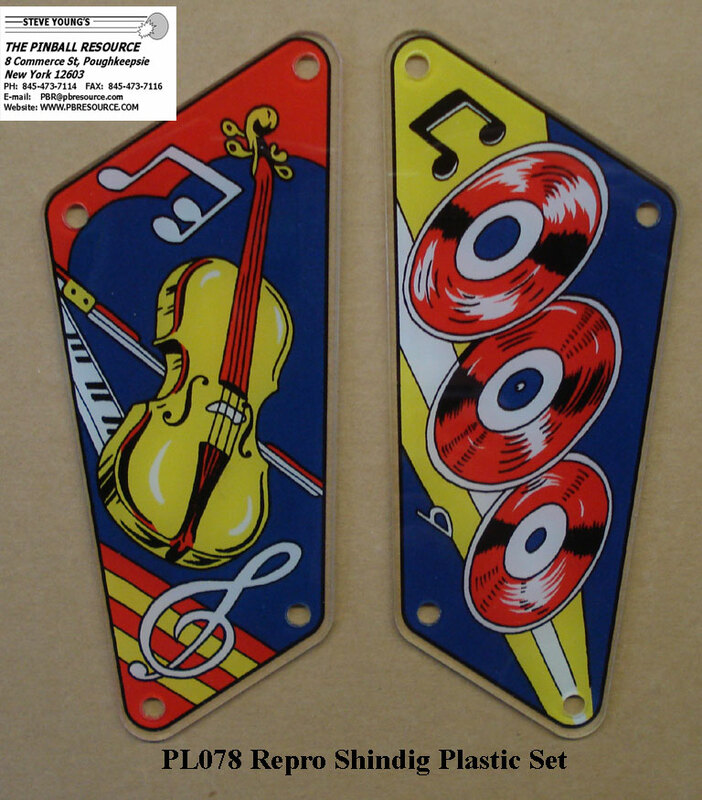 Well....I never thought I would need to make them....but just received the stampings for Gottlieb A-4583. This is the small (A-1496 type coil) drive coil housing cover with the nutted coil stop A-4862 installed. I guess after all these years of pounding with missing and loose screws, enough have broken that we have exhausted our scrounging these up for customers. This part will also replace A-4589 which had a similar stop that was staked in place. It can also be a substitute for A-17191. 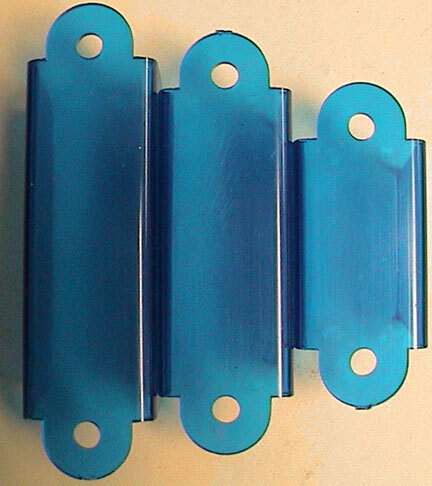 This part is used in Small Step Switches and some Player Units. This part is 1-1/8” Wide -Gottlieb had multiple parts that all look the same but have different widths, please ensure the part you need is 1-1/8”. So....new number GTB-A4583+ is available at $9.86. Another sticky little part bites the dust! We have had many requests for the little rubber plug bumper that Bally used in many assemblies to cushion a plunger returning to rest position. We always sent customers off to the local hardware store. With local hardware stores becoming extinct, I decided to go off in a quest to find this bumper for stock. Success. Bally used several of these, two of them interchange. R-231-11 and -14 may exchange, so we have one part for both. R-231-11 was used in drop memory drop target banks, and credit knockers. 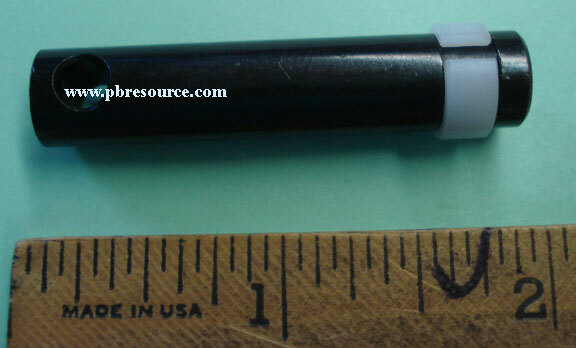 R-231-14 was used in chime units and the ball grabber (Nip-It). You may find other useages in Bally mechanisms as I didn't do a thorough search. Our part number is BLY-R231-11 for both applications; cost is $0.35 each. Now on the next one (working on replacements for washer head screws if everything works out). 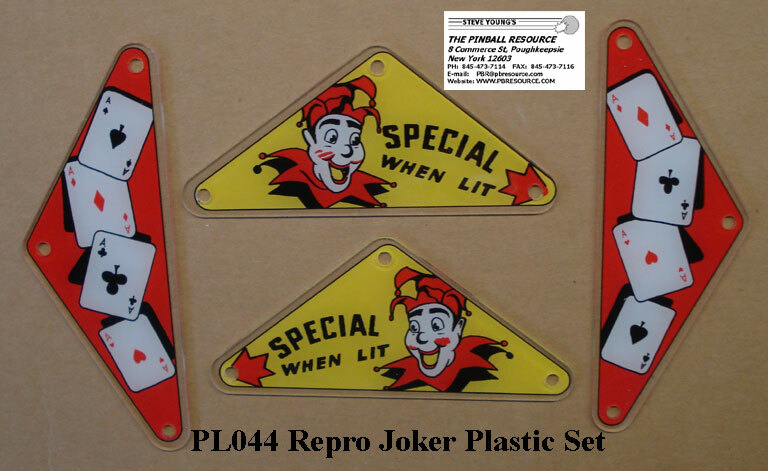 Per the news item on the SCOREBOARD plastic sets, we just received newly produced plastics for JOKER, CORONATION and SHINDIG. The artwork was re-rendered using my samples and a variety of photos by Ryan Claytor. The engineering drawings were located for all the dimensional data from the Gottlieb Archives. And the plastics printed and laser cut. The results are outstanding. I have installed on my games...what a difference from the "bacon" that I had. They will make an equally stunning improvement on your games, too! I have more sets planned based on the acceptance of this batch. These are shipped with a protective layer to be peeled from top and bottom before install. Enjoy! Ya know, sometimes the simplest parts solution brings a smile to my face. Over the years we have had untold inquiries about a part that hardly ever shows up in any catalog, but is apparent when it is missing. Wondering what that is? Bally and WIlliams games from the 70's. Bottom arch. White. Round. Lights up......credit lens! In the 70's both Bally and Williams (also Sonic) used a white plastic snap-in lens on the bottom arch (bowtie) above the left instruction card to indicate that you had credit. When it is there, you dont think about it. When it is missing, there is an empty hole begging to be filled. Fixed. Found a substitute. Cheap. In stock. Dont know why I didnt think of/find it sooner. Hindsight is so 20/20! Our part number WLL-3A7266, cost is 50 cents. 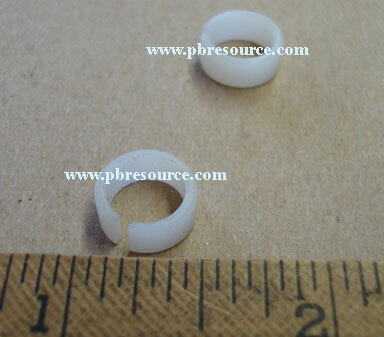 Part is white and snaps into a 3/4" diameter hole. Fits Bally, Williams, Sonic. Now off to the next (hopefully simple) problem. As promised in the note regarding the 5" bell shell (B-2091+), the hardware arrived today to finish the assembly. Works perfectly...sounds just like it oughta! Since Gottlieb® evolved this part to use a A-5194 coil, that is how I built them. Usage will be mostly E/M so, no diode on the coil either. Available from stock starting today. Listed on our Bell/Chime/Knocker Webpage listing the different needs for Solid State Premier games. A long time in coming! For years we have had to make excuses when someone asked for old type pop bumper bodies for deco/daisey caps. "sorry, not available" "sorry, no used ones" "try the 8997 bodies, but they will change the appearance of the game a bit, sorry" "can you arrange the broken part away from the player?" "can you re-glue them?" These were all the familiar responses....until today. Today, we announce GTB-25W. Thanks to a customer in NJ who got his son interested as a project, then picked up that work and worked with a molder, samples back and forth, discussions with us and molder, corrections, and we have 25W bodies. This type of body was used by all the manufacturers for pop bumpers from the beginning of pop bumpers (1948) until sunburst caps were introduced (1965). Part number for ordering is GTB-25W; pricing is 3.50 each. Careful with ordering, as the dead bumper body is GTB-25A. Enjoy! Well....not a pinball part, but newsworthy anyway! Today we received a forgotten stash of standard sized shuffle alley pucks. These measure 2-3/4" diameter and were used on shuffle alleys BEFORE the introduction of 10-1/2" pins...so, first half of the 50's roughly. We have had constant inquiry about these and my response has always been something like "go make friends with your local machinist or machine shop". With the introduction of the large pins, the puck diameter changed to 2-15/16". Using the too-large pucks on the early machines makes them way too easy to beat....using a too-small puck on modern machines makes them too hard to play. The correct size is important. Part number is PUCK-STD, cost is $16.00. Available in red or blue. Beginning in 1951, Gottlieb® used a 5" gong as one of the sound elements of their games. This sound became a classic woodrail and later sound (used for many years). Williams also used the same size. We have had a string of inquiries over the years since we ran out of the stock of this bell from Premier days. The part looks easy enough...but no tooling to make. Finally put pen to paper and wrote a rather large check to make a new tool (and I thought injection molds were expensive). Bells ordered in October, due November, came in last week but look and sound the way they should. Williams reference was 1B-1178 which will ship as the same part. 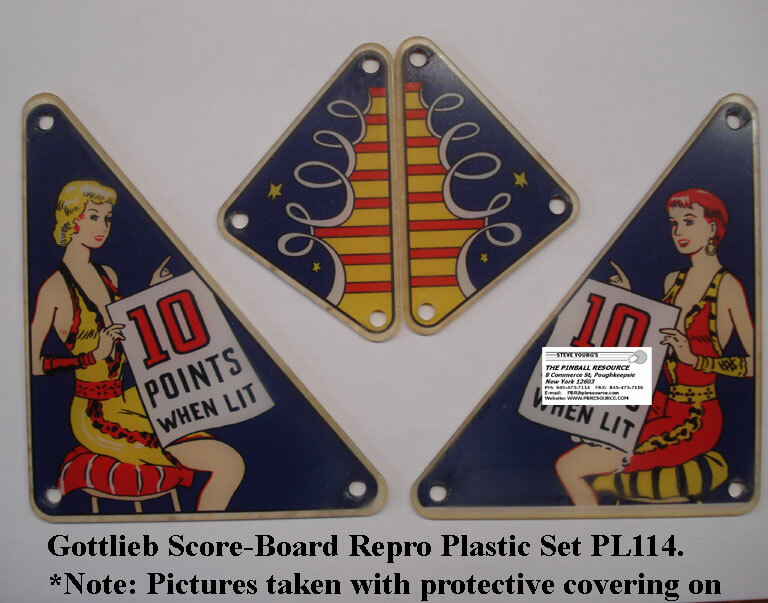 Pinball Resource announces a new collaboration with Ryan Claytor to remake some sets of Gottlieb® playfield plastics from the 50's. The first set is SCORE BOARD. 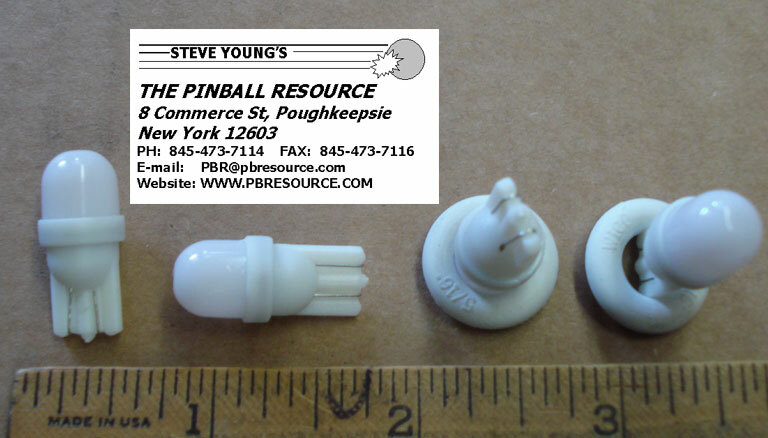 It is available now under the part number "PL114" at $75.00 for the set of 4 plastics. These plastics have been re-rendered by Ryan and then printed on PETG and laser cut. I am impressed with their quality. I have selected a few more titles (firstly driven by plastics I need for my games!) that will be announced when finished. The emphasis is on sets which have not been done anywhere previously. The production runs will be small and we will see how it goes considering the time needed to re-render artwork (from poor originals) and generate cutting files. With the increased popularity and new folks involved with electromechanical games for the first time, we have created new web page for relays. PBR has spent additional time trying to resolve part number conflicts and the like using our extensive documentation and knowledge and experience. Some conflicts got resolved, some conflicts created other questions which remain mysteries. Due to the nature of how games were designed with different features and how they were produced for very short times, everything cannot be covered with these pages. 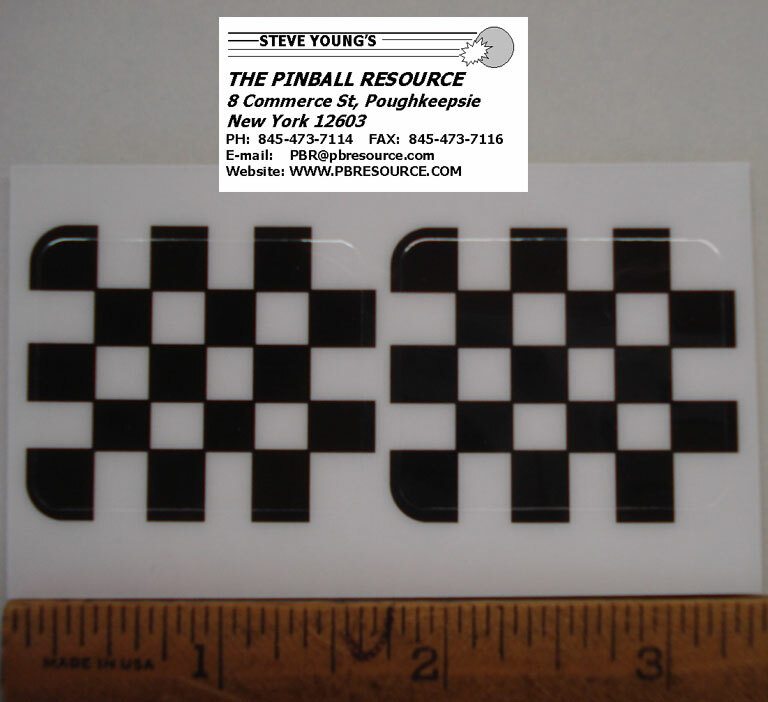 We hope they are a start for the novice and helpful for experienced pinball people. Because there are alot of variations that may be game specific or time-frame specific, we encourage you to consult with us on variations that may not be covered in these pages. We have had frequent requests for replacement parts for the Gottlieb® relay-sized stepper called an "AS relay". We have rejoiced when we found old stock as they have been difficult to supply. We are seeing more and more of these that show carbon tracking leading to burned boards or damaged metallization. We also are not finding many new discs in old stock any more. Because of this, I enlisted the help of one of our circuit board folks to have new ones made. They arrived yesterday and I installed a set to do final checkout last night. They work! The original board had rivetted eyelets for wire attachment. We have decided to leave them as metallized pads for direct wire attachment. I may install eyelets in the future. If and when we do this, we will update description, price, and photos. A8933 (artwork marking on board) is actually sold as GTB-A9016+. A8934 (artwork marking on board) is actually sold as GTB-A9017+. These parts along with following the adjustment instructions provided by Gottlieb (and you MUST follow the order of adjustments!) will help achieve satisfactory performance of AS relays in many games. 8/24/16 Solution back in stock. Many S/80 owners have been requesting the mirror silver backglass trim (top and sides). We ran out of old Gottlieb® stock. I found a supplier after searching awhile. It only took 3 requests for quotation starting in 2014. The precision of the cut and the fact that there were 2 lengths and the "reliabilty" of this new vendor led me to decide to offer only a slightly longer length for the customer to trim upon installation. ORIGINAL numbers were A-19573 (length 25-9/32) and A-19574 (25-15/32). NEW number A-19573-4 with a length of 26 inches exactly. Pricing is $3.06 each. Furnished with a peel-off protective film. 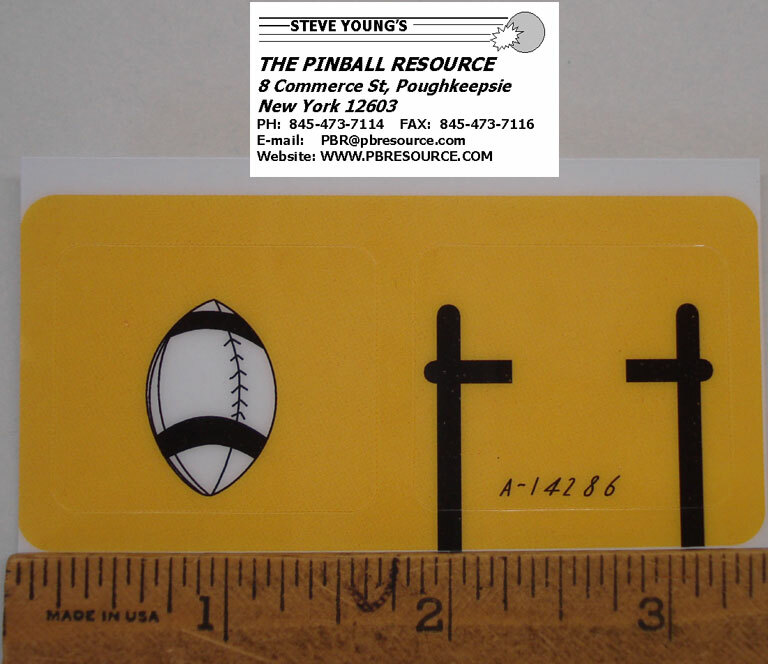 Looking to learn more about Steve Young or more about The Pinball Resource? Well thanks to Nick from For Amusement Only EM and Bingo Pinball Podcast, you can! (The old GameRoom Magazine article about PBR is listed below). For those Baseball game collectors, we now offer shinny new bat handles. For as long as I can remember, we have had to dodge the question: "What do I do about my rusty, stretched out, missing, etc. springs on my Bally step units?" After spending a significant amount of time researching what springs were used when, I have settled on a set of springs that I feel will fit the requirement....so, we are here to announce 3 new spring kits for Bally step units. These are the full sized units that have a large diameter plastic step gear. KT-BSTEP-01 is a kit of 4 springs for single step resetting step units. 2 coils on unit, unit steps down once per pulse of reset coil. This is typically a bonus unit or game counter. Price is $6.69 per kit of 4 springs. Kit contains SP100-110, -113, -120 and SP370. KT-BSTEP-02 is a kit of 3 springs for fully resetting step units. 2 coils on unit, unit completely resets with one pulse of reset coil. This is typically a coin unit or a ball/player unit on a multi-player game. Price is $5.19 per kit of 3 springs. Kit contains SP100-113, -120, SP370. KT-BSTEP-03 is a kit of 1 spring for continuous step units. 1 coil on unit. Does not reset. This is typically a match unit. Price is $1.65 per kit of 1 spring. Kit contains SP100-120. All springs are also individually available for sale. All springs were made here in the U.S.A. by the same manufacturer that originally made them for Bally. Can't get any better than that...they are even color coded as per the original. Have fun (with your Bally's)! part number WLL-12-6357 "reinforcing clip" This part slides on (tightly) to the top mounting stud before starting to insert the screw. It fits only the top stud as the other is too short. So, it fits the pin number WLL-31-1445.1 only. Use is one clip per pin, so 10 for a full set. Also, it does not fit the similar stud on the pin used for Chicago Coin/Bally/Midway. Since today's pins are a bit stiffer than the older ones, this should help avoid splitting. Presto! An old dog now has a new trick! This part is listed with our other Shuffle Alley / Bowling Alley parts. All plastics are screened on PETG and laser cut, protective film on front and back to be removed at the time of installation. Actively restoring games, I am finding necessary items that are a pain to fabricate or find. 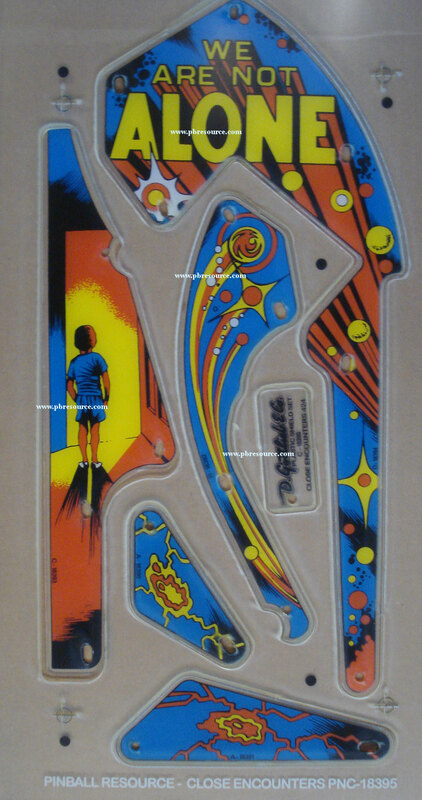 Here is one: Gottlieb® and others used flat nickel plated shiny metal shields over top of playfield posts to create lanes....before plastic rollover guides came into use. They made an annoyingly large number of them of differing lengths. On a game, they are rusty and dont clean up well or are dented, or both. -High polish one side, protective covering to be removed. -Hole in each end #18 drilll to print...ends rounded. As hinted when we announced the wooden leg production, we have successfully produced the two different single player wood lockdown bars used by Gottlieb® starting after WWII (the bars up to WWII and shortly, maybe, thereafter had mitred corners...cut at a 45 degree angle). These bars start with the first straight cut rails and run thru the end of wood rail games in 1960 with single player cabinets. GTB-SA19 part number. This lockdown has a 1/4" wood rib that fits a 1/4" slot in the top edge of the cabinet front. The carriage bolts are mounted to 2 separate mounting plates screwed to the underside of the bar. This bar was generally used from 1947 to 1954. GTB-D1008 part number. This lockdown has a sheet metal channel running the entire length of the underside of the bar. This fits a much thinner slot in the top of the cabinet front. This bar was used from 1954 thru to 1960. Here are the technical details. Maple. Ready for finish sanding, any staining, and finish desired. Complete with 2 carriage bolts and 2 wing nuts. The bar is shipped assembled. You will likely disassemble to complete the finishing work. This bar has taken 2 vendors plus my personal shop to complete. There are 18 operatons alone to make the wooden part of the bar; add to that the operations to fabricate the mounting plates/channel and then to assemble the bar, and you see why this is the first production we have been able to do since the 1980's. Most of the wood shops we have approached have declined to even quote the part. We hope you enjoy our efforts to make a complicated part that is often missing from Gottlieb® wood rail games. 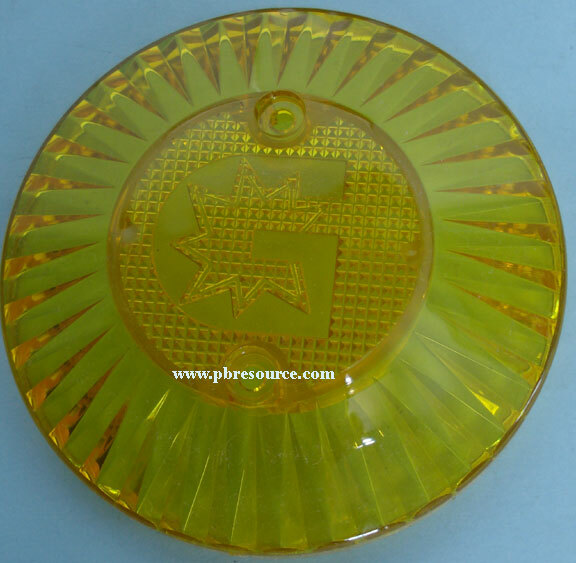 We have located and resurrected the mold for the System/3 Gottlieb® bumper cap 26635 and have produced the cap in transparent yellow and clear (no color). This cap was used in 4 colors: clear, transparent red, blue and yellow. All are available now under this part number (specify color wanted) at $3.00 each. Now available Bally Step Up Plunger S496-100 and Collar C342. A picture of the assembly, collar installed on the plunger. After several false starts, we have a suitable suppler for wooden pinball machine legs! We have tried to get them made only to find unacceptable costs and several shops simply "no-quoted" the job due to expense of wood. These came out very nice and I hope this supplier can make other wooden parts for us. 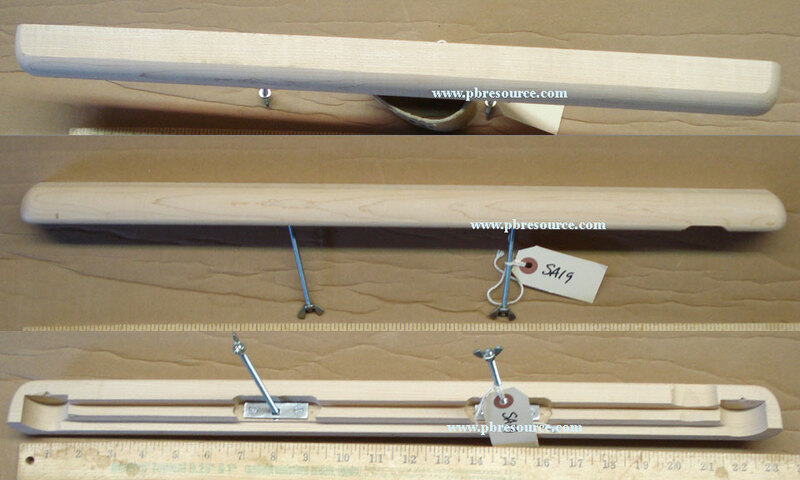 Part number is LEG-31WOOD, price is $31.25 per leg (making a set $125.). Once upon a time, when Gottlieb® first introduced drop targets, they used a funny "abbreviated" plug bumper for the trigger arms to reset against. The design was okay but over time the rubber got a groove worn into it, then fell out or was lost and the arm then reset too high. This caused the bottom of the drop targets to be over-stressed and then the lip broke off and the targets reset against the bottom of the playfield glass and would not drop correctly. We never found the source of the bumpers, cost to make a mold too high, etc., etc. Fast forward to 2015 and one of our customers, Larry Dale in Washington state (obviously a person with too much time on his hands!) got curious, did some research and came upon several candidates. He was good enough to forward that information to me. I researched the leads and ordered samples, and bingo! we found the correct original bumper. I have ordered stock, it has arrived. It is stocked here as GTB-986 and is priced at 0.30 each. PLASTIC SET is GTB-22162-3+. The originals we sold were sold under 2 individual part numbers...22162 and 22163. It looks like they were separated by Gottlieb® after printing into the 2 part numbers as the layouts did not exactly follow the color scheme....a puzzle, but fact. We have combined the 2 sets into one part number, since there is no scheme to why one would buy "half" of a set...Spirit is one set. Selling price is $157.60. MOTOR DISC is GTB-22204+. We were happy to find drawings and film for this backbox animation disc as we have never seen any samples outside of the game; there was no stock at the factory when it closed. Selling price is $41.35. We hope that collectors of this game around the world enjoy these plastics. I think they came out great and I look forward to making additional games' plastics using more of the original films we have in the archive. Beginning in the late 1970's, Bally began using an opaque brick red color flipper button and matching housing. We have had many requests for these. They have been available in very small quantities as old stock only. As a result, the use of the transparent red button and a white housing as used by Gottlieb® was the only solution. 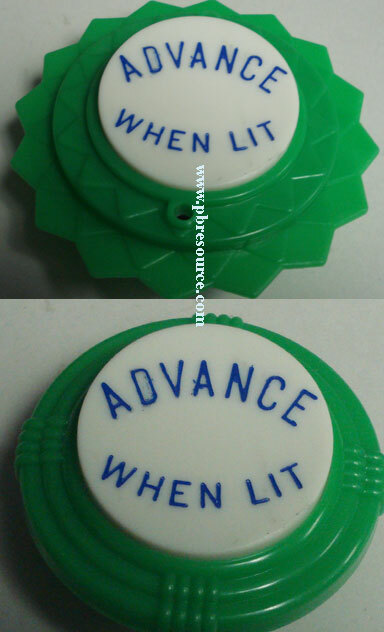 By working some molding tricks, we have been able to remake the buttons in the original colors. These parts will allow collectors to preserve the original appearance of their Bally games. We have been busy sorting the Gottlieb® Archive parts we got recently. Customers have been enjoying purchasing the NOS Playfields, NOS Translites, NOS Manuals/Schematics, etc.., We just used a piece of the original artwork / film to make the Haunted House Webbed Playfield Cover, see below. To answer customers question of “What other parts did you get”, we have put together a partial list by game name of some of the Gottlieb® Archive Parts that are now available and have not been previously listed. 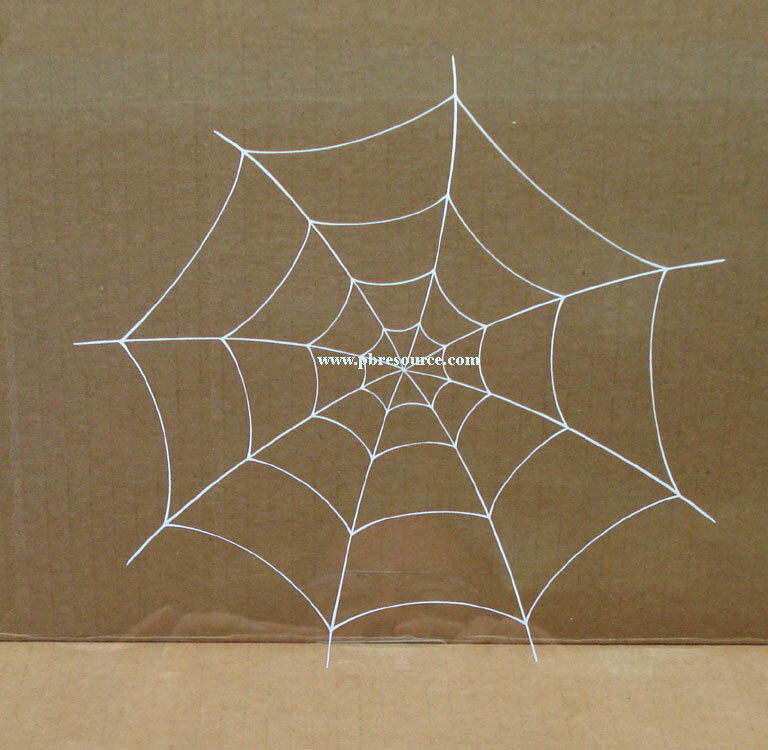 10/7/14 Gottlieb® Haunted House Webbed Lower Playboard Cover Reproed using original Artwork / Films. 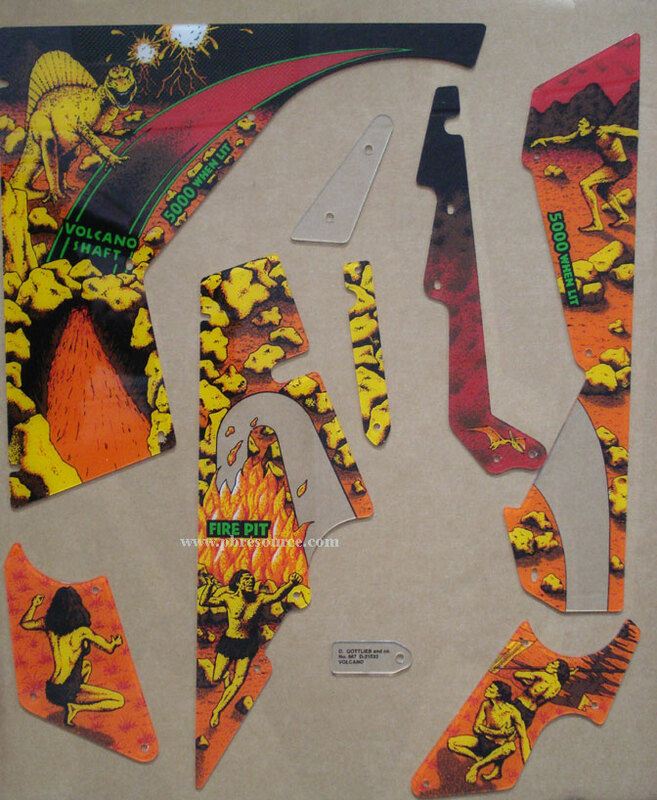 Yesterday we posted to our Haunted House web page, the webbed lower playfield cover (GTB-21226+) as a new Pinball Resource product. Besides being a nice part, it represents the first part we have reproduced using the original films that we acquired with the delivery of the Gottlieb® Archive parts. While most of the paper and parts items that came in have been filed in a retrievable manner, we have only scratched the surface on the artwork files/negatives/films that arrived. There are many benefits to using the original film files: ease of use, specification of exact original colors, avoidance of scanning difficulties, etc. This product we used to serve as a pipecleaner for what we hope are many projects to come; the films are good, the vendor can utilize them and the product is outstanding. A win-win-win situation. 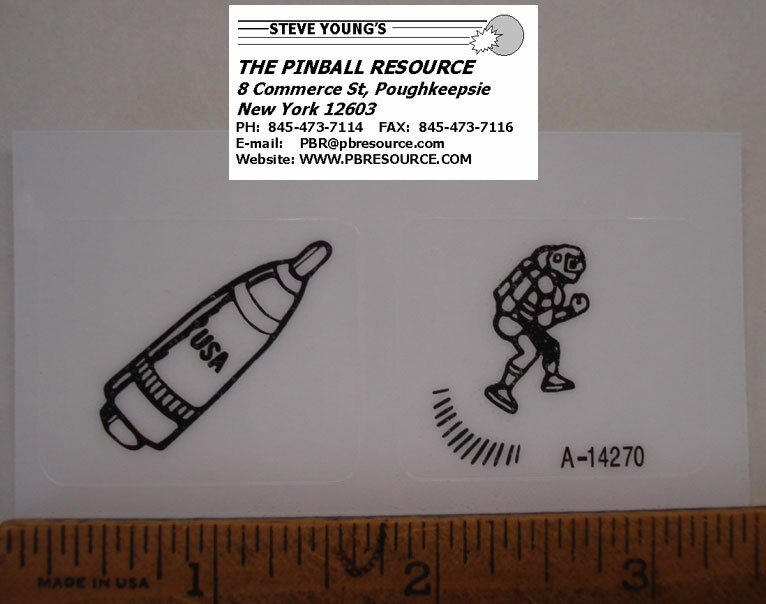 The webbed playfield cover GTB-21226+ is screened on 0.080 polycarbonate per the original print and has a factory scratch cover on the back, a vendor applied scratch cover on the artwork side and is $28.92 each. We hope this part will enhance your enjoyment of this historic game! We have remade the Twin Star Rollover Button in Opaque Red. This is useful for collectors who are changing their E/M games over to LED lamps and for game builders/designers to allow a classic feature to be used on new games using LEDS lights. The Opaque Red limits the amount of light that passes through the button. 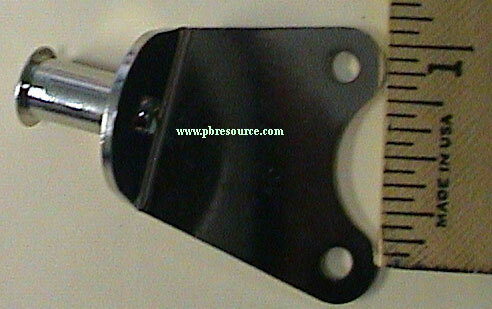 Part number is GTB-D11966LR and can be seen on our Rollover Button Webpage. This motor has been carefully tested in actual game application. We hope this motor keeps many of these games doing what they are supposed to do: providing fun! Update 6/9/14 Announcement of importance to Gottlieb® pinball collectors, restorers, and historians. On Thursday my crew plus a professional moving crew moved into PBR storage the bulk of the remaining Gottlieb® archives, bringing most everything Gottlieb® back under one roof. Let me explain. -PARTS (again)...because any move of this complexity and magnitude is imperfect, some parts remained mixed with what went to Pelham and when things like the playboards came here, we were asked to return for their archive one playfield of each title before we were able to sell the remaining playboards. -TOOL RECORDS (from late 40s) and the bills of material (for mid 80s and up) were sent to us when Premier was dispersed. We have had this and used this since. -the playfields are inventoried and will be offered for sale coincident with this news announcement. -the documentation sorting has begun with me working nights and weekends to assemble a workable retrieval system of a massive amount of information which includes (at the time of this writing): original schematics and manuals with production notes, variations for individual markets, problems discovered in production/operation, bills of material, factory photos of the games, their inside details, artwork films, etc. Pretty exciting stuff! It will take a major effort over time to understand and relate all the information. Gottlieb® ran an impeccably well documented and controlled manufacturing operation...they recorded everything important to control production and saved it. The documentation begins with the first game after World War II...so this an extensive history. So far, I see only a few unexplained gaps where I fear files have been lost in the several moves that this material has had. Stay tuned, as they say, for more details. We have access to the bills of material already (WWII to end of System/1). This will allow questions to be answered that are not documented in any of the parts catalogs. This "immediate availability" is a bit of an oversimplification....all this material up to the mid-late 80s is hardcopy....not in any information retrieval system, hardcopy....filing cabinets, folders, rolls of paper, bankers boxes of files, etc. Over the past year and a half, we have been busy with recovering the hot stamping activity that was once done by our friend and associate Donal Murphy before his untimely death. This has been accomplished and we have added quite a few new designs and products that has only planned at the time he left us. Thanks for your support and patience! 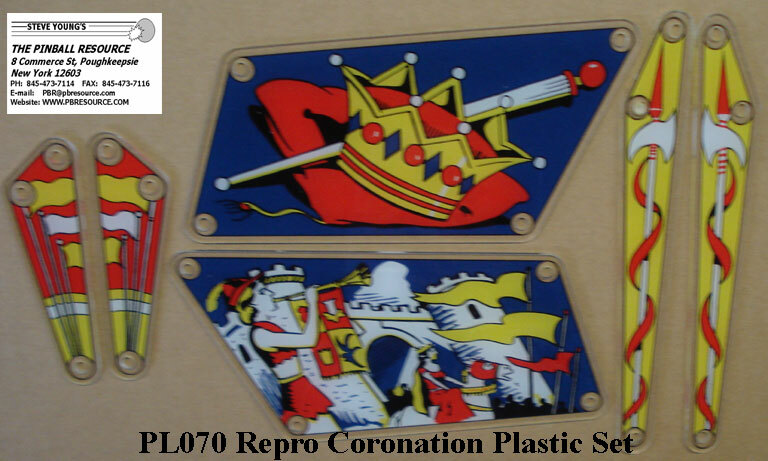 We are now turning our attention to resuming the reproduction of new titles of playfield plastics. A week ago or so, we released the lower plastic set for BLACK HOLE (p/n GTB-21304+ $36.80). Today we are releasing the set for JET/SUPER SPIN (p/n GTB-C16967+ $63.22). As time permits, we plan to keep the new titles coming. Your "votes" will help us choose the next projects. Thanks and enjoy! It has taken forever, but the cigarette holders that were ordered in August 2012 (!) have finally arrived....tooling issues, plating issues, and another long supplier passing away all contributed to the delay. We have BACK in stock GTB-A3889+ for the curved rail games cigarette holders ($9.46). We have NEW in stock GTB-A3623+ for flat rail games cigarette holders ($9.37). We made the flat rail style both for all the Gottlieb® multi-player cabinets as well as for a number of customers asking for this part for baseball game restorations. Both have a centerline hole spacing of 3.50" and are beautiful in bright nickel plate. 1. Williams coin mechanism locking plate WLL-1A4253. While this sounds like a silly part, it is quite necessary when trying to put coin acceptors back into Williams games (1966-mid 80's). Coin mechs were commonly removed by operators attempting to prevent home sale games returning to street useage (competition). 2. With the help of Mike Vitale, a long-awaited part is emerging into the marketplace: the animation pool balls for Bank-a-Ball and Flipper Pool. Part number is GTB-B8720. Mike has finished the 1-8 balls in faithful colors; since the 9-15 balls require a painted stripe, they are taking a bit longer before they become available. Replacement ball is supplied with the attachment rivets needed. After repairing a number of mid-70's Williams score motor gearboxes and after having had a number of inquiries, we made a batch of new motors. This is motor #14A7883. Priced at $90.00 it is a less costly remedy than the repair charge plus worn parts. Finally back in stock are the mid-60's to early 70's Gottlieb® stainless steel side rails. Part number is "GTB-D8159*set". This set covers June 1964 (Bonanza) to 1969 ± (cabinets #SS5 and SL5). Interestlngly, unless you actually got out a set of prints and calipers, you wouldn't realize (as we didn't either) that the flipper buttons are not in the same place....the RHS button is lower than the LHS button. I believe this was to accommodate the flipper button lever on the inside of the cabinet. When the flipper switch was moved from the playfield to the inside of the cabinet directly behind the button, the hole moved. To ascertain which rail you need, measure from the bottom of the flipper button hole to the bottom edge of the rail...if your RHS buton is lower, then this set of rails is correct for your game. The 70's rails, which are out of stock, will be here before long. These have the buttons equally spaced right/left. We encountered a batch of steel when making the last batch of 31" chrome legs that did not give an acceptable plated surface......what to do? We decided to make a test batch of cream white 31" legs to salvage the batch. These legs were used in the mid to end 1950's by Gottlieb®. There were 3 "color schemes" that were used in this timeframe...chrome, cream white and red...the legs matched the metal front door color. These are power coated and look great. Due to the circumstances, pricing is same as the chrome 31" leg. We hope you enjoy them! Part number is LEG-31W. - Enhanced mini kits to have flipper bushings previously ordered separately. - Added 2 new full and their partial kits to the family of Williams kits. These kits cover the late 50's thru the late 60's where kits were not available previously. To make room for these kits in numbering, the old KT-WFLIP-01 and 01M have been renumbered to -04 and 04M. The new kits are -02/2M and -03/3M. Please watch carefully the beginning and end games that are referenced, they sometimes overlap...following the production listing doesn't always provide the correct sequence. There is no -01/01M kit at present. We are trying to assemble one and have run into too many questions to be certain of what hardware and what range of games is appropriate. 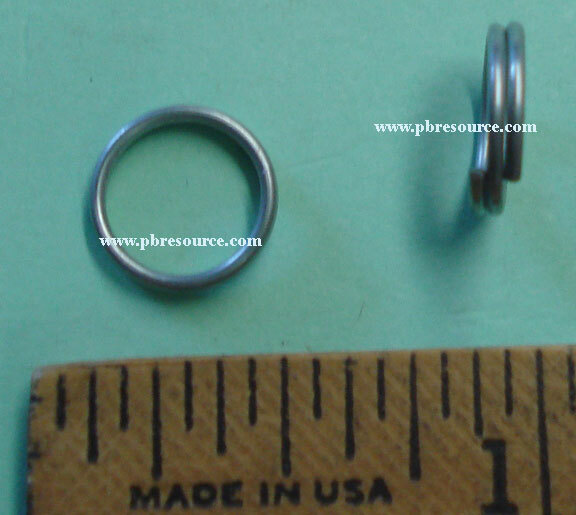 - Added FA605 spring washers to many kits. - Created new webpages to detail kit components and alternative/additional parts to facilitate customers wanting to purchase either just that individual part, or to allow for customers to buy extra of a particular part. There are so many variations of flipper hardware used for games that the kits can only serve as a beginning base from which you can build. Things such as multiple flippers needing flipper enablement switches, lane change switches, etc. all are done outside the kit environment. - Created part numbers for plunger and link assemblies for several of the kits where individual purchase would have required plunger, pin and link to be specified separately with an assembly instruction. We are in the sad position to announce the death of Donal Murphy in Chicago. His wife called me Saturday morning to tell me he had died in an accident at his farm south of Chicago on Friday night (October 26). We are all shocked to say the least. In what I am writing here, I am searching for the right words. The Pinball Community has lost a very important contributor; he was a friend, associate, partner, fellow collector to more pinball people than I even am aware of. In addition to this he was an invaluable asset in moving parts between operations and in the operation of a significant portion of the hot stamped products we offer. This will be missed by all of us as we work to move the missing operations to our building in Poughkeepsie. It has been several months since the untimely death of Donal Murphy. I thought it time to provide an update of the progress we have made in restarting the hot stamping process and product here in Poughkeepsie. We have finished an expansion of our floorspace to allow rearrangement of equipment, installation space for additional equipment and storage of unstamped raw product. This was finished while we wrestled with the Christmas rush and didn't have lots of time to devote to stampng. We have received from Chicago about 99% of the hot stamping dies. There are a few missing dies that we are still looking for (and we found some that we don't know their usage..see the unknown cap we have posted here: no one has made any suggestions as of yet!). We have restarted the majority of Gottlieb® drop targets with no issues. We don't have a lot of black targets, so these will be stragglers until more raw stock arrives here. We have tested many of the Bally designs and have encountered no difficulties. We await stock to restart stamping. Today (1-23-13) we tested successfully red sunburst 10 w/l caps. No large stock here yet, but no issues. We are in the process of redesigning and making stamping fixtures for 2" flippers, so these should move forward shortly (all flavors). Overall, I am pleased with the quality of the stamping and look forward to returning to stock the items we all miss. Thanks for your patience and good wishes that have been extended. We appreciate them! We would like to thank our customers for their understanding for availability of hot stamped products. We have been very busy replenishing the items that we have tooling for....this has involved making support fixturing for the new process. Besides making the process more efficient, I feel we have achieved better print quality and consistency. daisey/deco cap products for Gottlieb®/Bally/Williams/etc. -The rest of the designs need time to run, there should be no technical difficulties. C609SET is OUT of STOCK. If you order the unprinted, we will substitute the blue. We know that there is stock that has to be located in Chicago and shipped in to provide the missing parts, both were run in even quanitities not so long ago. We just have to find them in Don's storage. Since the last update, we have continued to make great strides in repopping most of our hot stamped product...at this time it is probably easiest to tell you the remaining problems rather than to rant on about what is done. We also have discovered a number of unusual/unknown patterns that we will experiment with when we are able to tie up the loose ends. Gottlieb® 63A ball shooter cover...waiting on parts to be molded. Gottlieb® flanged bodies...waiting on stamping machine modifications. Dies and nest are here and we need to do some toolroom work to modify stamper. Hope this will happen in the next few weeks. Stern drop targets...there are a number of missing dies (which must all be together somewhere in the Chicagoland area in some place that we have failed to look) : slash S, dotted S box, 1 2 3 4 5 (7 patterns total). Williams caps...several missing dies (see above)...100 diamond, 100 squiggl, JET and W logo. For any of the missing caps...there are some odds and ends in some colors as well as some NOS pieces in my personal stock to help out a few applications....please ask. As always, "thanks" to all our customers who have been so patient and understanding during this process. During the July 4th shutdown week, we were able to stamp the Gottlieb® flanged bumper bodies, thus returning them to stock status. We are very happy with the print quality we were able to achieve and believe you will be as well....thanks for your patience. I think we printed and bagged nearly 800 bodies in that week. The die for Pink Panther is not useable, a new die is being pursued. It is our intention to make this design as well. Now we will make a last ditch effort to locate the missing few design dies (see last update) before commissioning replacements. We have successfully printed caps for Caveman and a new die arrived today for the 20577 design used on Pink Panther pop bumper bodies....both are available for ordering. Neither design was possible before. We have officially ordered the 11 dies mentioned in other updates as missing. They will start rolling in per a priority we established with the die makers...first the Stern lightning bolt S, then 12345 for Flight 2000, then a couple of sunburst cap dies: JET and 100 squigl, then the remainder as they make them to bring us to completion. It figures! Having made a build order for the missing dies, they have been found! Starting today, we will begin filling in the stamped product that was waiting for these dies to become available. As of this writing, we have completed the classic Stern lightning bolt S and the dotted S box drop targets. We will next do the High Speed 'W' logo, then sunburst JET and Squiggle 100, followed by the remaining few designs listed in the older updates posted here. This will bring us full circle to completeness for availabilty (actually a bit more than complete as we have added caps for Caveman and the bumper body for Pink Panther which had not been available). Thank you for your patience and understanding during our period of recovery. Now, we will entertain the collecting community's suggestions for designs that haven't been tackled before. There are a few items in short supply, but this is due to arrival/delay of certain stamping stock and is a normal course of business. Thanks for your support and understanding during these months of recovery. This will be the last hot stamping update that I expect to write in this series. Driven by customer requests, we have made the Shoulder Screws used in Gottlieb® 70's E/M games, A1058 and A1059. We are in the process of assembling some new kits to rebuild pop/jet bumpers. Three are ready to go. These provide a convenient method to get all the motive parts in one kit as well as a way to utilize improved design parts in this critical application. You know, "pop bumpers have to pop!". The Williams kit provides rebuild capability that was not previously possible due to the limitation on parts availability. Additional kits are planned. 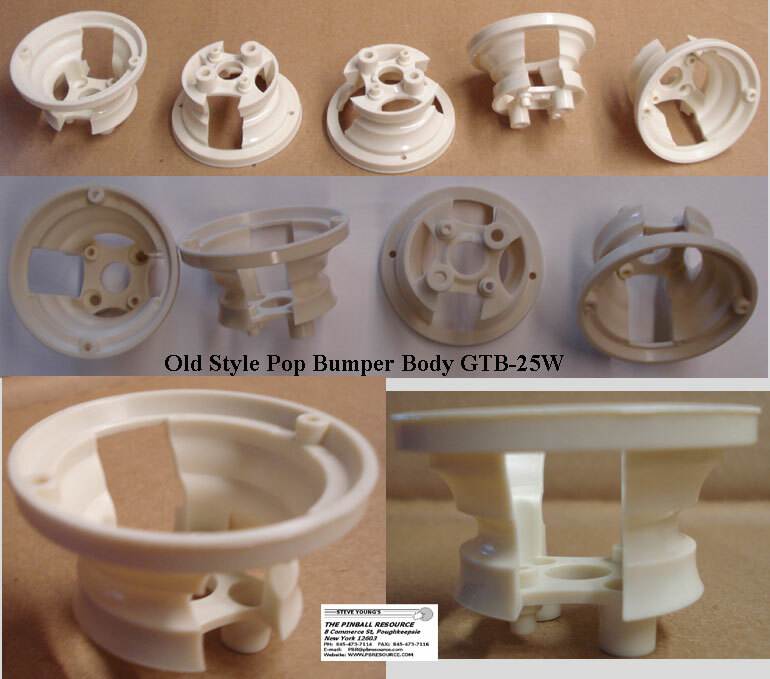 KT-GPOP-01 For Gottlieb® AC type pop bumper applications. This kit is applicable with the replaceable stop starting late 1957 but can be used earlier by either installing the replaceable stop in original swaged stop bracket or saving the stop for use elsewhere and not using it as part of the kit. Parts include plunger, updated armatures, replaceable coil stop, spring, sleeve, elastic stop nuts for the rod/ring and repacement screws for the retainer. Some early applications may have non-removable coil sleeves. Steel armature supplied is newer "folded" design which upgrades flat style; application may dictate flipping armature "up" to clear mounting bracket. Very late AC pop bumpers have 10-32 style coil stop which can be replaced with earlier style in this kit by centering carefully. Kit price is $9.16. KT-GPOP-02 For Gottlieb® DC type pop bumper applications. This kit is applicable with the beginning of DC (no shading ring, solid steel stop) pop bumpers in the the late 1970's thru the end of Gottlieb® production. Parts are same as KT-GPOP-01 without the replaceable coil stop (and all the notes). Kit price is $5.49. KT-WPOP-01 For Williams AC "keyhole style" jet bumper applications. Replacing parts in this style pop bumper has always been parts limited due to the special armatures and plunger design. These armatures are identified by their signature "keyhole" cutouts for attaching to the plunger. 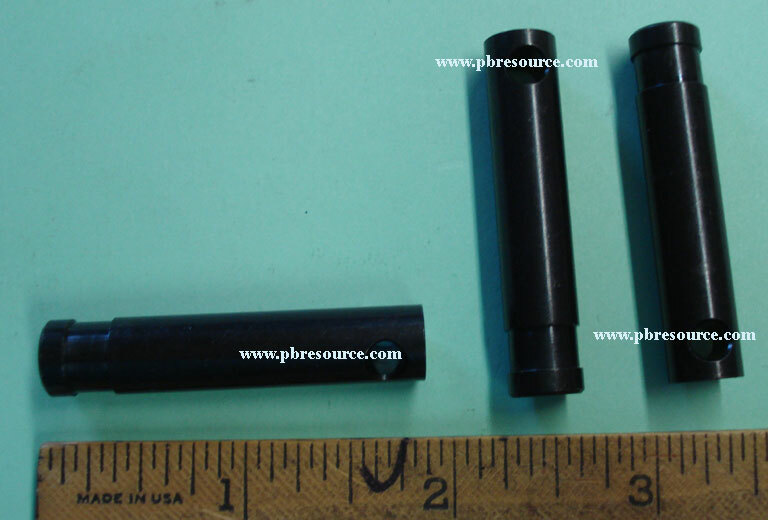 By redesigning the plunger, we have been able to utilize the Gottlieb® bakelite and metal armatures with this new plunger to give new life to these tired assemblies. Applicability starts mid 1950's (after carbon ring design) up to the first DC jet bumpers with Granada/Spanish Eyes. Kit includes new design plunger (only available in this kit), bakelite and metal armatures, spring, sleeve, elastic stop nuts for the rod/ring and replacement screws for the retainer. Kit price is $5.92. KT-WPOP-02 For Williams AC/DC standard pop bumper rebuilds. Kit price is $5.40. 07/24/12 – Bally SS Collectors/Historians -We need your Help! We got a Cap die that we can not identify and need your help! Does anyone know what games uses CAP1? them to the pinball community. These are all reproduction glasses..
we have are out of stock with the folks who originally produced the glass. or is currently offered at. Prices are net, no discount offered. The list of glasses can be seen! 07/28/11 – Gottlieb® Devils Dare -Hot Stamped Drop Targets Now Available! 03/09/11 – New Bumper Cap Available! We have over 1,000 variations of Bumper Caps listed on our webpage! Multi Products...open frame (visible gears) and closed gearbox (baseball, bowler/shuffle and arcade). We will not be servicing mid-80s thru current closed gearbox motors which have been remade. Many of these are listed for sale on our website. We will not have the parts for these and it is more cost effective generally to the customer to buy a new replacement. One exception to this is that we will continue to support repair on the planets motor for Judge Dredd (14-7985). 06/24/10 – New Bumper Caps Available! Deco/Daisey Slant “ADVANCE WHEN LIT” Reference games like Williams Apollo. 05/25/10 – Gottlieb® Volcano Plastic Set Now Available! Driven by customer requests, we have remade the Gottlieb® Volcano plastic set. It's Part #21032A $89.46. 03/24/10 – New Bumper Caps Available! 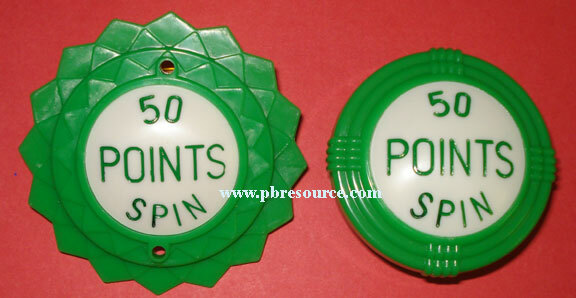 Deco/Daisey Domed “50 Points Spin” for games like Gottlieb® Flipper Cowboy! 01/13/10 – New Bumper Caps Available! 09/24/09 – Complete Reproduction Gottlieb® Lockdown Bars for games 1960 Flipper – 1966 Dancing Lady! See all of our Lockdown Bars! 08/26/09 – Many New Reproduction Gottlieb® Tray Liners For Wood Rails Now Available! 08/13/09 – New Bumper Cap Available! The book sells for $69.99! 10/10/08 – Curious About The Pinball Resource? 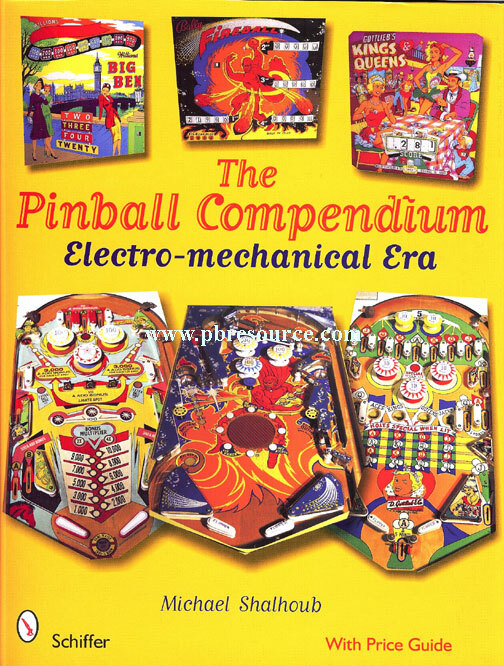 Did you know that Gameroom Magazine published an article on The Pinball Resource in 2002? 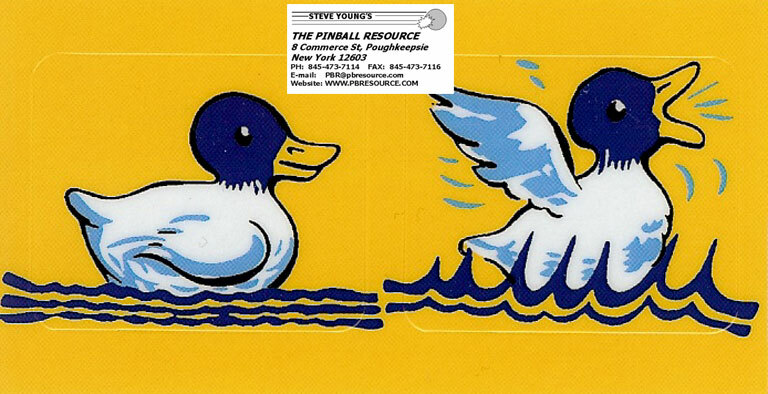 With Gameroom Magazine permission, you can now read the artcile and get some insight on Steve Young's The Pinball Resource. 09/05/08 – Gottlieb® Royal Flush/Card Whiz Plastic Set Now Available! 06/20/08 – Replacement Bumper Cap for Allied Leisure and Fascination Games! 06/17/08 – New Bumper Cap Available! 3 New Style Bumper Caps Now Offered! 04/24/08 – Gottlieb®/Premier Commonly Requested Ramps, Parts, Assemblies, and Molded Parts Now Listed! Gottlieb® Commonly Requested Ramps, Parts, Assemblies, and Molded Parts! 10/12/07 – Gottlieb® Large Points Switches for “AG” Relay Now Available! Driven by customer requests, we have made the Large Point Switches for Gottlieb® E/M ”AG” Relay stack. We have most of the small point switches, housings, springs, and coils in stock for these “AG” Relays. 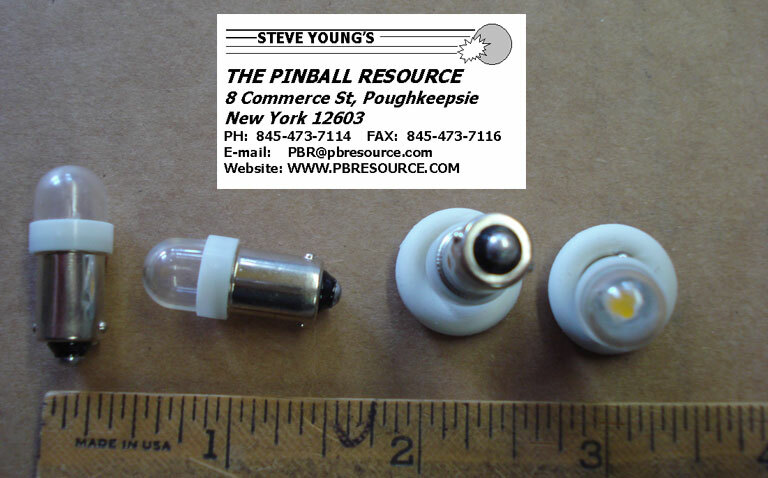 09/20/07 – Spring Kits for E/M Pinball Games! We have created Spring Kits for E/M games. This is a grouping of the commonly requested springs for Step Units, Score Units, and Roto Target Units. We have made these kits for Williams and Gottlieb® E/M games. These come with documentation on exactly which springs to replace. Click to see our Spring Kit Webpage! 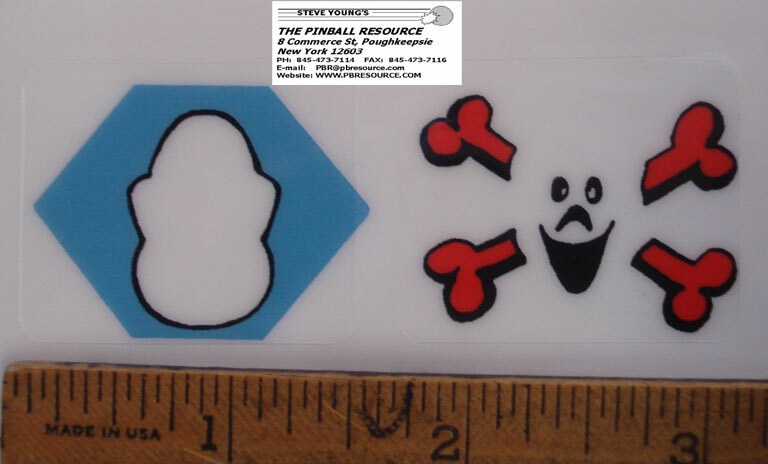 Now Available – Replacement William Coin Entry Plates for games from ~1966 Big Strike -1985 Sorcerer . These have the countersunk entrance! *Note- Graphics match originals, but do not include part number which was not visible when properly installed. When installed, part appears identical to the original. 8/8/07 – New Sunburst Bumper Cap Available! Stern Red Sun with Black Bowling Pin Bumper Cap. These can be used as a substitute for Memory Lane! These have been added to our Caps Webpage for Pop Bumpers, Thumper Bumpers, and Jet Bumpers! 5/08/07 – Now Available ! Bally Unique Hot-Stamped Caps and Drop Targets manufactured under license from Williams Electronic Games, Inc. in conjunction with Illinois Pin Ball Co.
Gottlieb® Raven owners rejoice! Cross Hair stand-up target faces were originally designed to go on Raven. They never made the production game! They can be seen on the game flyer! We have found the original mold and have made these available for owner who want their game to look like it was designed to look! These can be seen on our Tools webpage (Along with our other Stand-up Target faces)! These have been added to our Caps Webpage for Pop Bumpers, Thumper Bumpers, and Jet Bumpers! These will makes complete bumper caps sets available for games like Gottlieb® Chinatown! 1/31/07 – Bumper Caps GTB-A11426 Now Available with Gold Printing! Driven by customer requests, we are now offering the GTB-A11426 Bumper Caps in Gold! 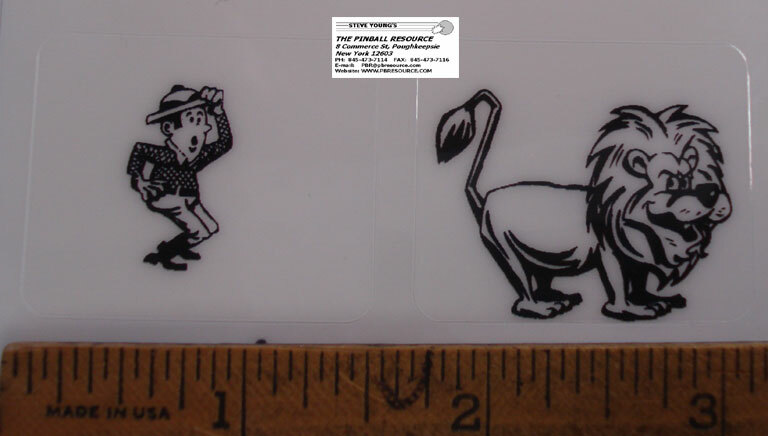 These were used in Gottlieb® games like Drop-A-Card and Pop-A-Card. These have been added to our Caps Webpage for Pop Bumpers, Thumper Bumpers, and Jet Bumpers! 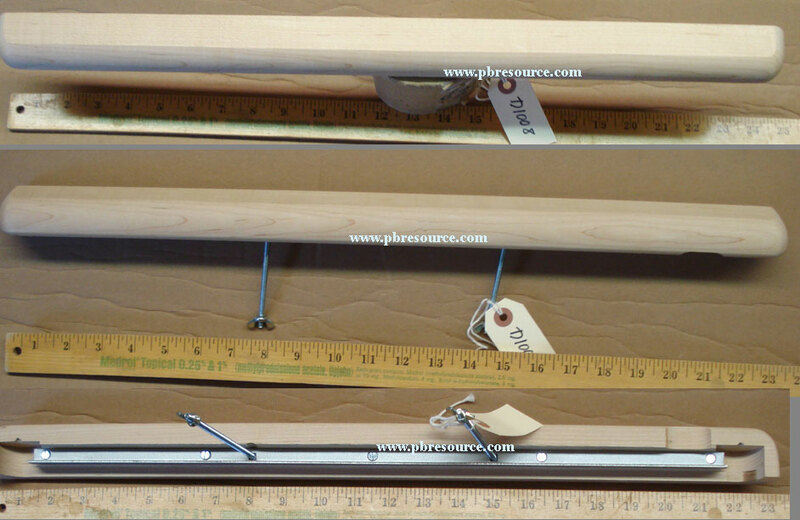 1/24/07 – Anodized and Natural Mini Posts Back in Stock! Used on 1960's and early 1970's games! 12/26/06 – Daisey Bumper Caps Now Available with Black Daisey Ring! 11/14/06 –Hot Stamped Single Side Rollover Guides “10 Points” - Now Available! 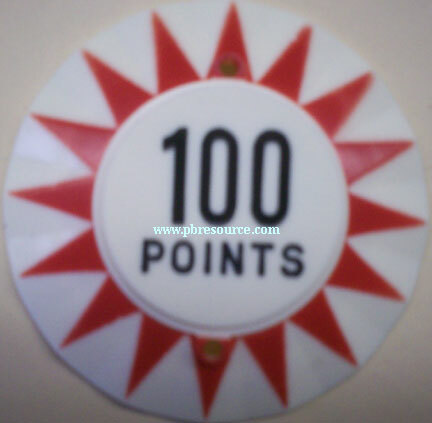 We have reproduced the Hot Stamped rollover guides used in games like Paradise, Pleasure Isle, and Hawaiian Isle. 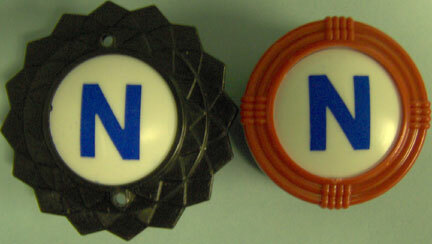 These are sold in pairs, a Yellow and Red with blue hot stamping of “10 Points”. These can be seen on our Rollover Guide webpage. 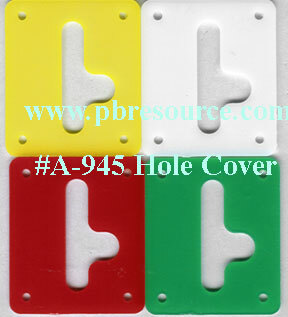 10/31/06 –2” Round Top White Flipper Plastics with Screw Hole with “Flipper” in Red - Now Available! 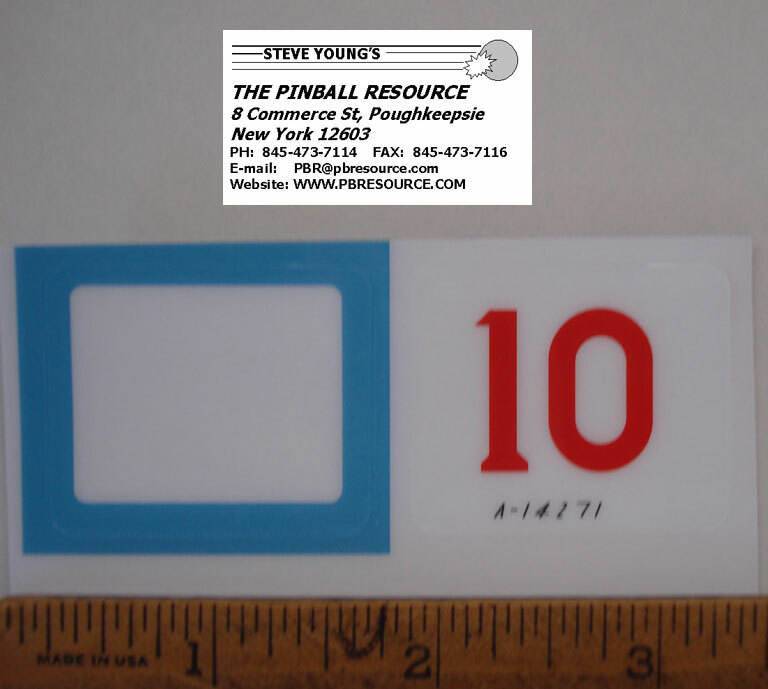 We have reproduced the 2” Round Top White Flipper Plastics with Screw Hole and “Flipper” in Red, used in pinball games from the 1950's-1960's. These are Hot Stamped, part #GTB-A5094-5WR, $14.00 Per Pair. Click here to see our selection of flippers! These were used on Older Stern and Williams 70's games! 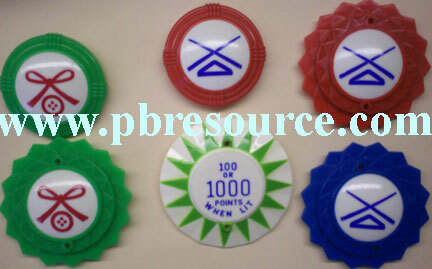 These can be seen on our Rollover Button webpage! 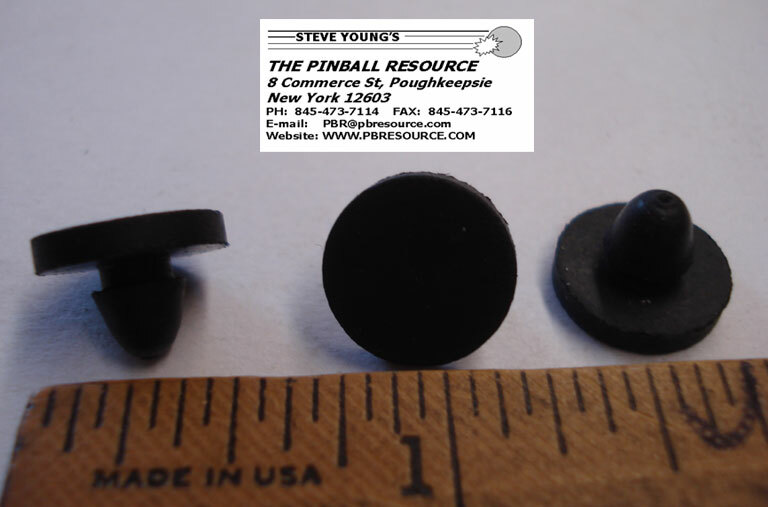 08/30/06 – - First Time Repro : Gottlieb® Plastic Hole Covers for Ball Hole Kickers! 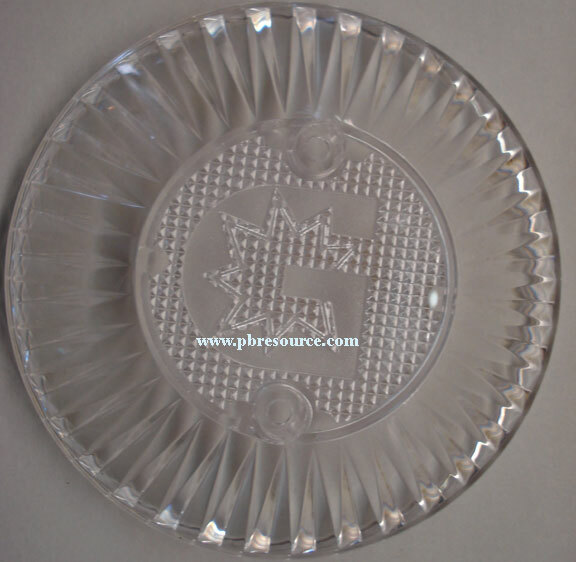 These can also be used to replace some of the other manufacturers Hole Covers. 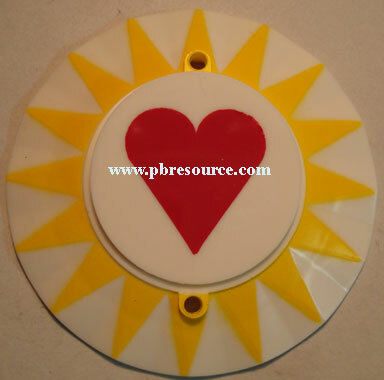 Please click the part number above to validate that your Hole Cover matches the picture! 07/28/06 –2” Round Top White Flipper Plastics with Screw Hole with “Flipper” printed vertically - Now Available! 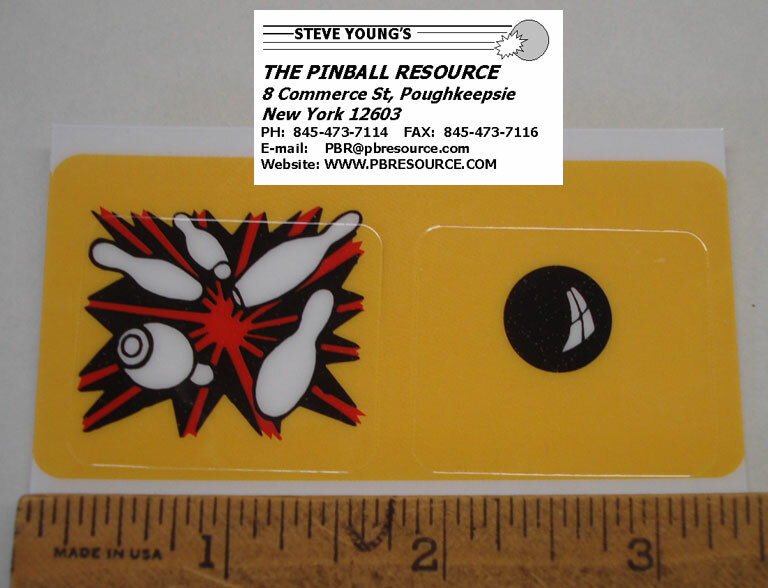 We have reproduced the 2” Round Top White Flipper Plastics with Screw Hole and “Flipper” printed vertically, used in pinball games from the 1950's-1960's. 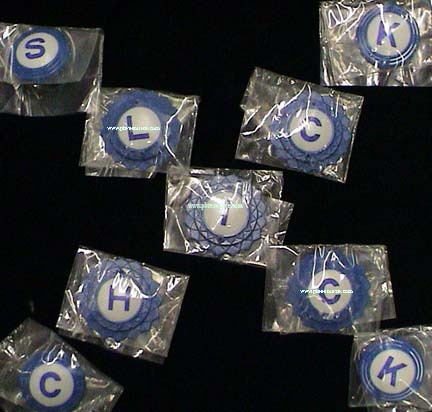 These are Hot Stamped in blue, part #GTB-A5093A, $8.00ea. 07/19/06 – New Signature Deco and Daisey Domed Top Bumper Caps Now Available! 07/7/06 – New Signature Deco and Daisey Slant Top Bumper Caps Now Available! 06/8/06 – New Signature Deco and Daisey Bumper Caps Now Available! Red Domed “POP” in white or blue ink for games like Dragonette! 04/12/06 – New Clown / Joker Target Face & Rivet! We have added the Clown Face / Joker Face to our expanding line of 70's Gottlieb®'s Target faces. 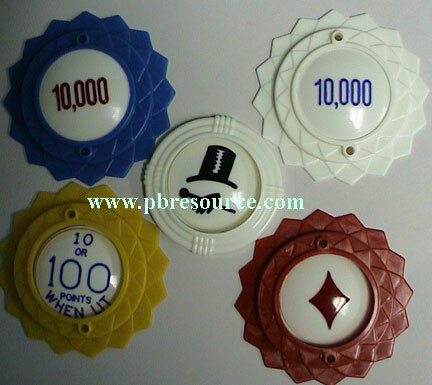 These were used in games like Royal Flush And Card Whiz. These target faces and rivets are $4.00ea. 03/21/06 – New Signature Deco and Daisey Bumper Caps Now Available! 03/17/06 – New Signature Deco and Daisey Bumper Caps Now Available! 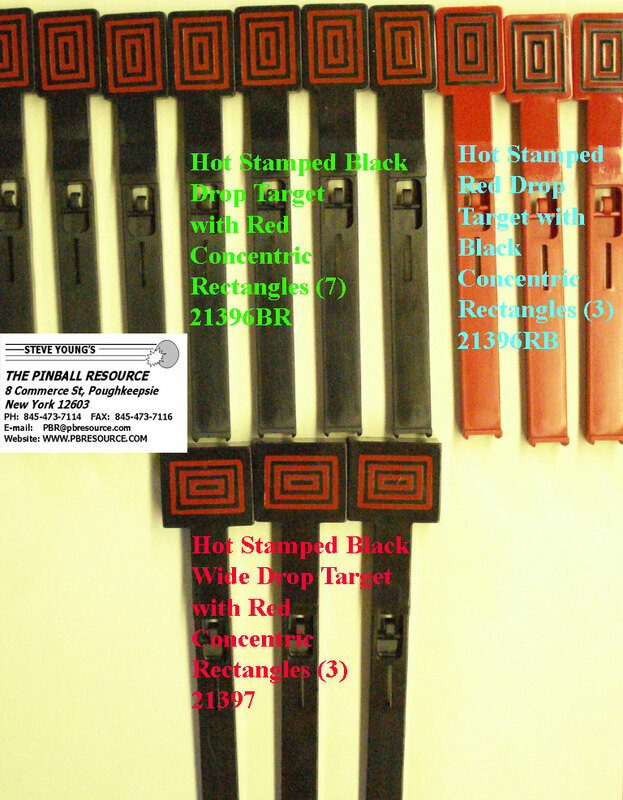 03/14/06 –2” Round Top Red Flipper Plastics with Screw Hole In Stock! 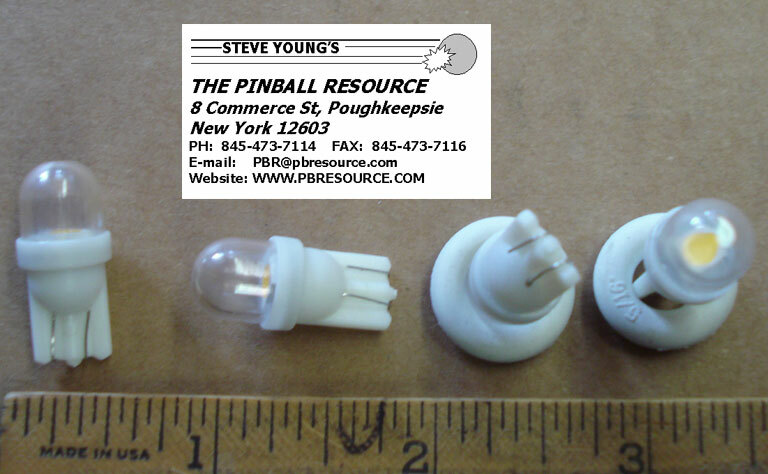 We have reproduced the 2” Round Top Red Flipper Plastics with Screw Hole used in pinball games from the 1940's-1960's. These are available blank or Hot Stamped in white or blue! Click here to see our selection of 2” flipper reproductions ! 03/10/06 – Old Style Rollover Guides In Transparent Blue Now Available! 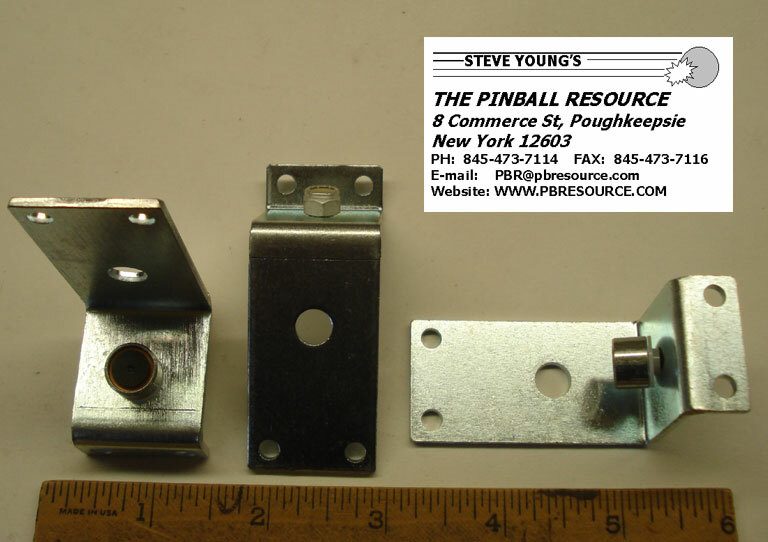 We have reproduced the Old Style Rollover Guides used by all pinball companies from the mid 50's through the mid 60's. We have now added Transparent Blue ones to our existing colors! These also enhance the older Bally games to let more Blue light shine through the rollover guides! These are $2.50ea and can be seen on our Rollover Guides Webpage! 03/07/06 – New Signature Deco and Daisey Bumper Caps Now Available! We now have replacement bumper caps for Stern's Dracula and Magic. These are $6.00ea. Please see our Caps webpage for additional bumper caps we offer! We have reproduced another Signature part, the Gottlieb® Rebound Bracket! These will fit Gottlieb® games from 1948 to the end of Gottlieb® production. 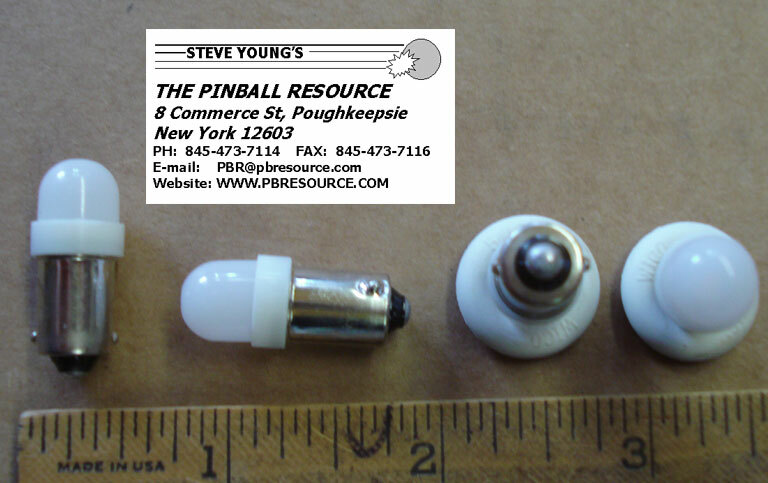 These are Nickel plated like most of our Gottlieb® Reproduction parts! These may work on Williams, Stern, or Bally games, look at the mounting bracket to be sure! Driven by customer requests, we have made the Gottlieb® Slick Chick Bumper caps. These can be bought individually or as a set. 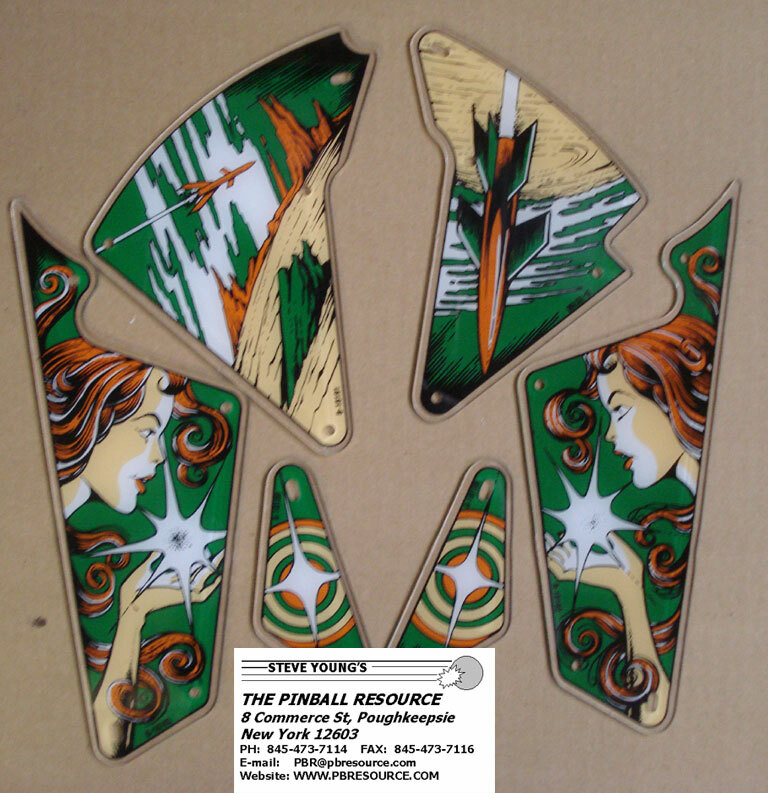 Another Pinball Resource Signature part! These are $12.00 Per Cap or set for $97.20(After Discount). Will also work with Barb Wire #31740 Ball Deflector with modification! We are now offering replacement Deco and Daisey Caps for Pop Bumpers, Thumper Bumpers, and Jet Bumpers! 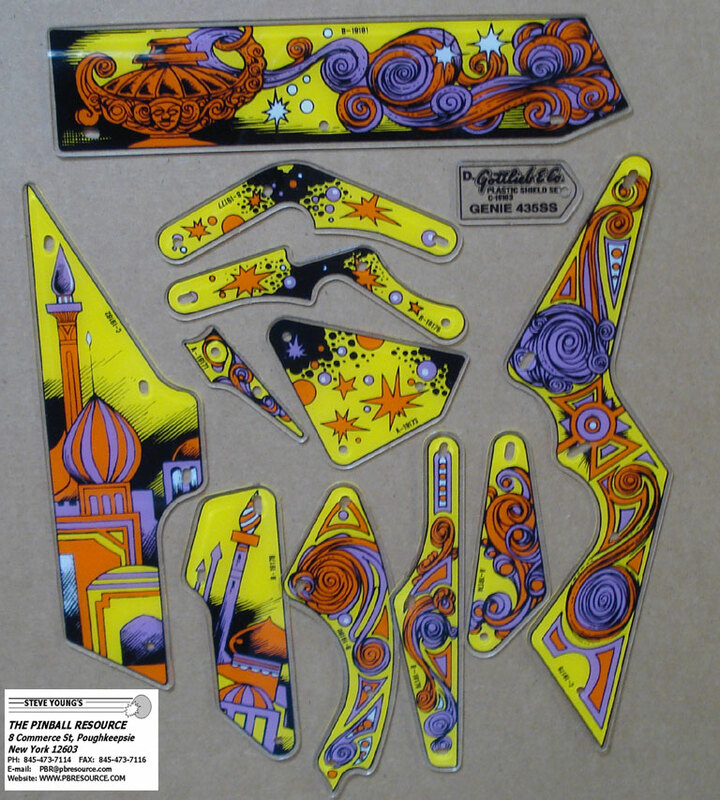 We are now offering Flipper Rebuild Kits for your Bally, Gottlieb®, & Williams pinball machines. 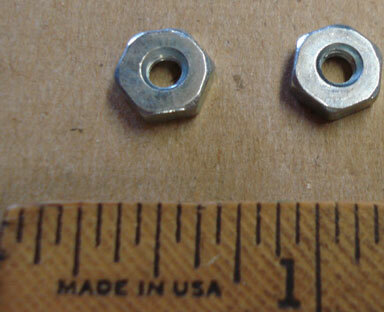 Replacement for 20-9718 Wing Bolt now in stock.